Welcome to Guinness! 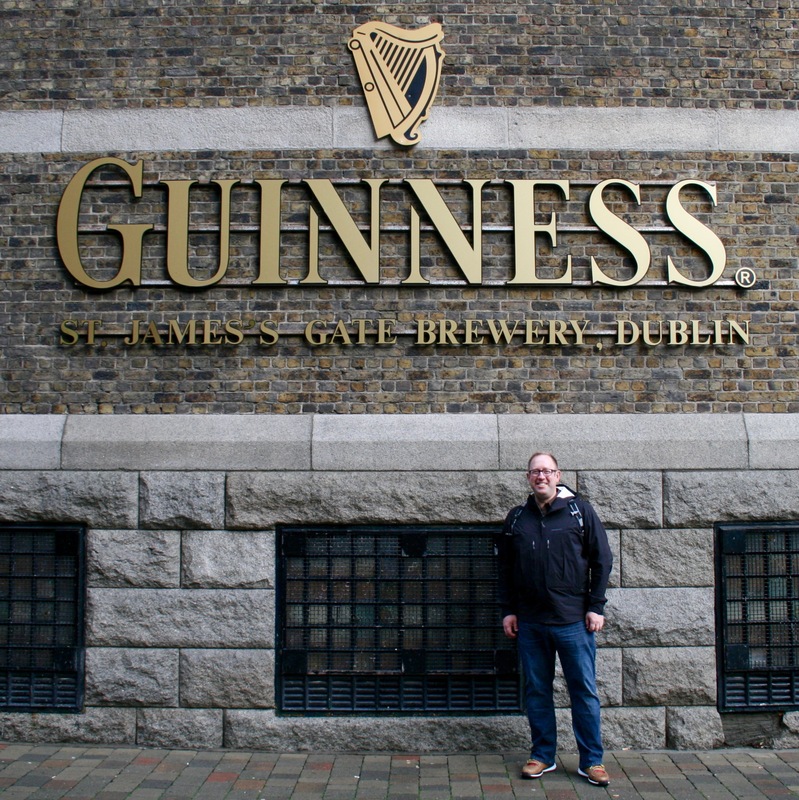 In front of the Guinness Storehouse at St. James’s Gate Brewery. Two things that go so well together are a pint of Guinness and St. Patrick’s Day. When one thinks of a beer to have on St. Paddy’s Day, Guinness is a sure bet. This traditional Irish Dry Stout is very interconnected to this popular holiday that honors the day that Saint Patrick left this world in the year 461 AD. Dublin is an amazing city that sits on the Western shore of the Irish Sea, across from Liverpool, England. The population of Dublin is only 528,000 where as Portland’s population is 609,000. 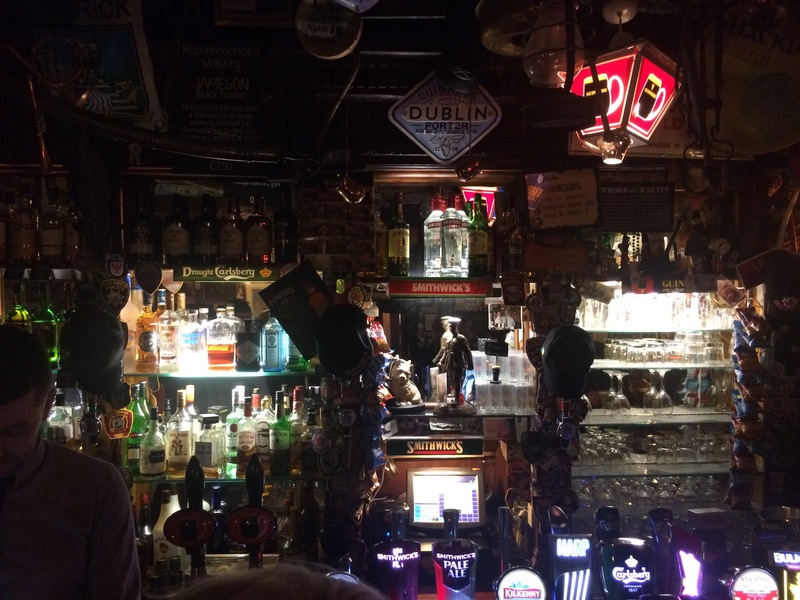 But the amazing part is Dublin is home to around 1,000 pubs with The Brazen Head being the city’s oldest, a definite must visit if you ever find yourself in Dublin. Drinking at The Brazen Head, Ireland’s oldest pub that serves many pints of Guinness as well as Irish Whisky. 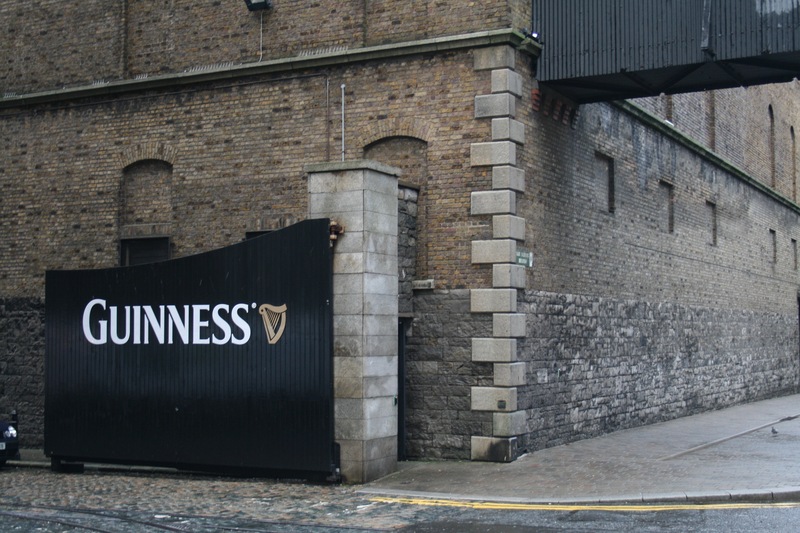 Arthur Guinness founded the St. James’s Gate Brewery in the year 1759. As legend has it, Guinness signed a 9,000-year lease on the original 4-acre plot of land in the midst of the growing city of Dublin, Ireland. Now this lease is worth nothing since the brewery took off and grew through the years to its current 50-acre site. Replica of the 9,000 year Guinness lease from the Guinness Archives. When looking over the modern landscape of the world of brewing many trends of beer styles have come and gone. One style and definitely one brand has remained constant, Guinness. With today’s short attention spans its easy to take our more recent history in American craft brewing and say that these styles are going to last for decades, even centuries but this thought process may be a bit immature. Our country’s 30+ years of craft brewing is still in its infancy compared to other beer scenes across the globe. Sure, the U.S. has had its ebb and flow of breweries over the course of our country’s 240 so years but not many if any at all U.S. brands can stand up to the image of Guinness. 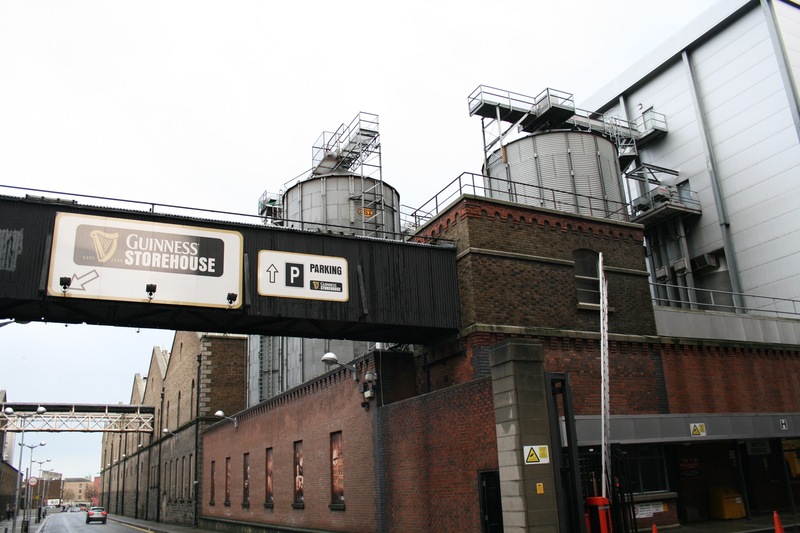 A view of the Guinness Brewery from outside the Guinness Storehouse. Upon entering the grounds of St. James’s Gate the thrill of being overwhelmed with brewing history will hit anyone. Standing amongst buildings that are over 200 years old is quite amazing. 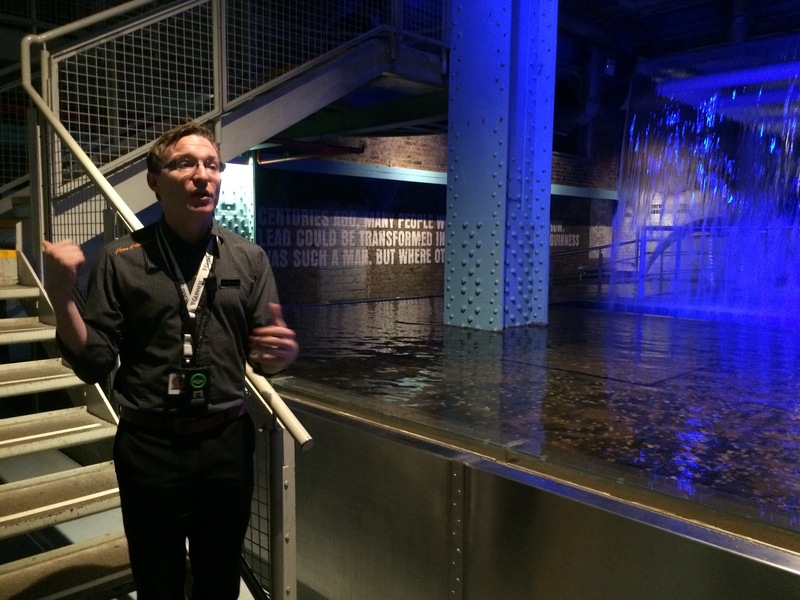 To begin a tour of the site this begins at the Guinness Storehouse. The seven floor Storehouse is where the brewery’s fermentation plant stood from 1904 to 1988, the year a new plant opened on the property. Since its closure the building has transformed into a pint glass shaped interior that if filled would fit 14.3 million pints of Guinness. 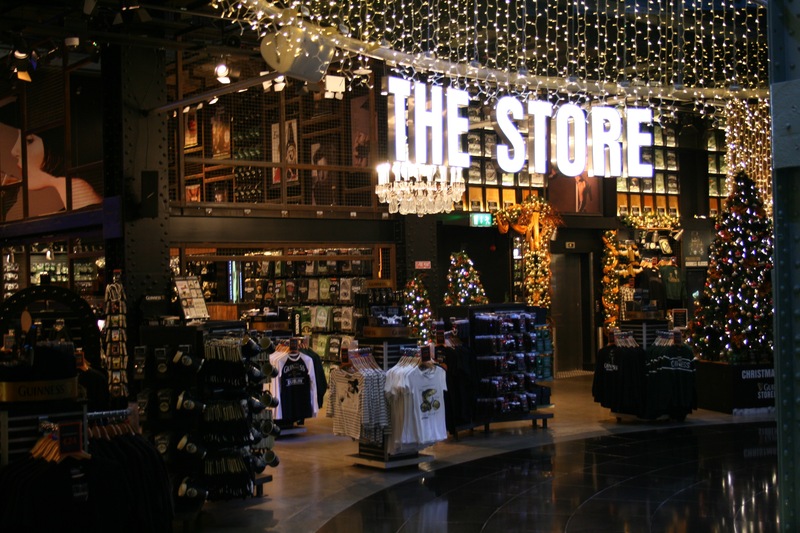 The Storehouse opened in 2000 and is now the most visited attraction in Dublin and sees 1.4 million guests per year. Guests through the years have included Paul Rudd whom was said to be one of the great ones to Tom Cruise whom was not all that well appreciated. Even the Queen Elizabeth II made a visit with demands that were far less than what the world’s most famous Scientologist made. 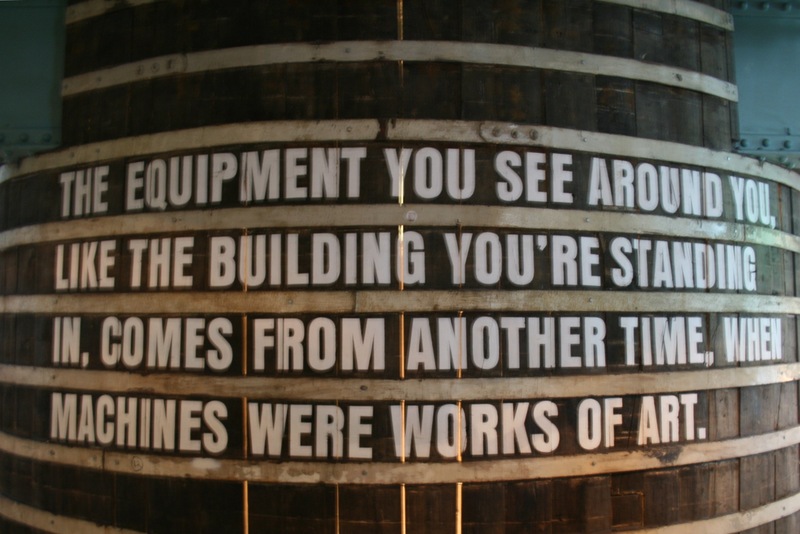 Inside the Guinness Storehouse is a museum of all things Guinness. There is a lot to see and take in during a visit, more than just a marketing exhibit from the brewery. 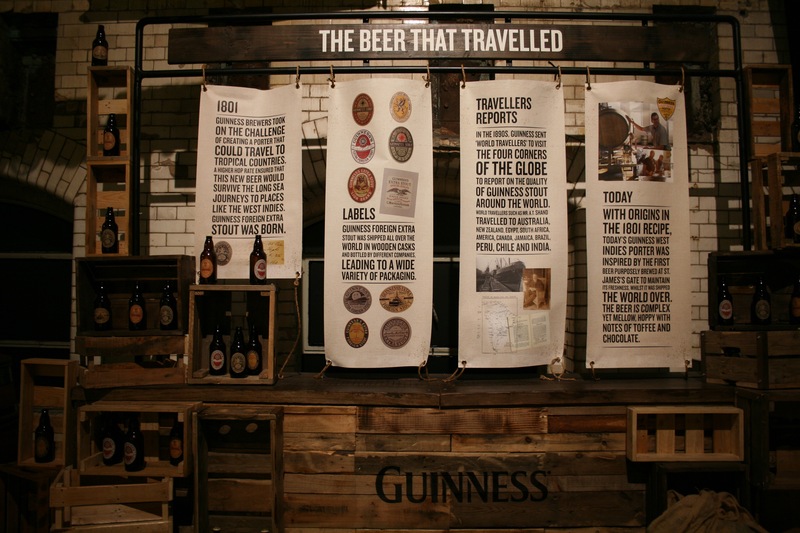 Guinness’ 257-year history is presented with many interactive exhibits and of course beer. 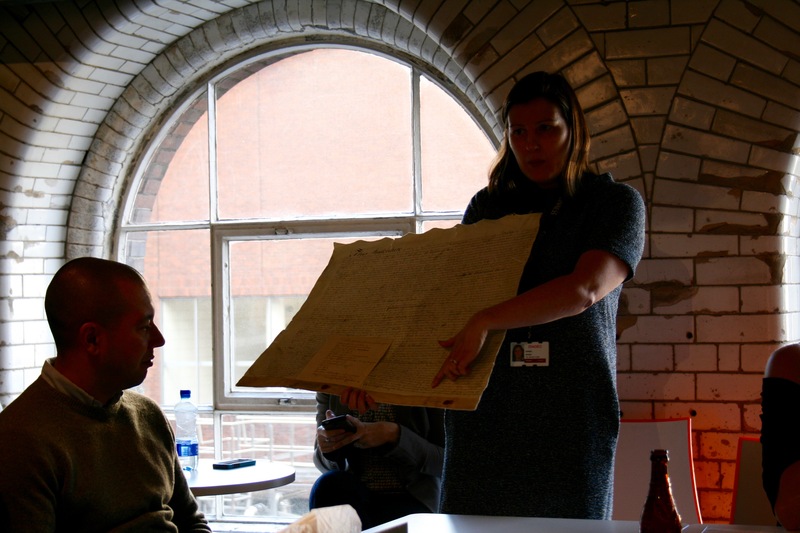 Guinness Archivist, Eibhlin Colgan, discussing old brewer logbooks that date back hundreds of years. The highlight of visiting the Storehouse is the history. On the second floor lies the Guinness Archives. 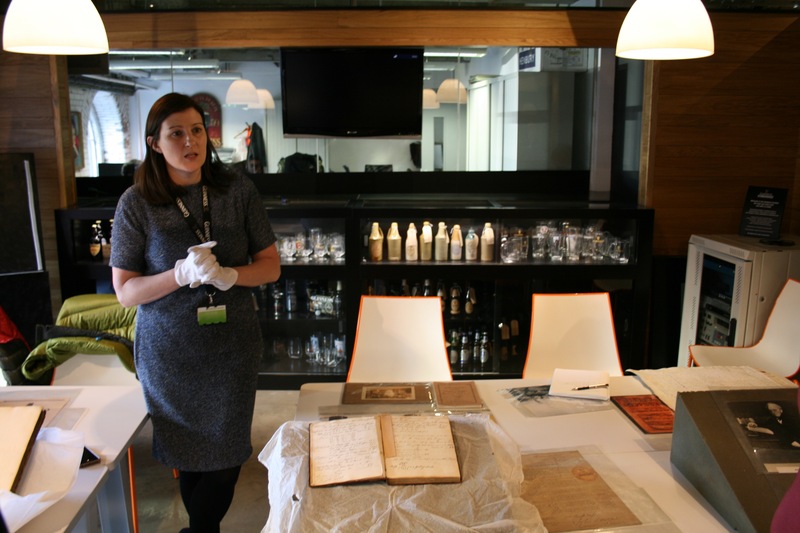 Eibhlin Colgan, the Guinness Archivist, maintains this secured area of Guinness history and memorabilia. 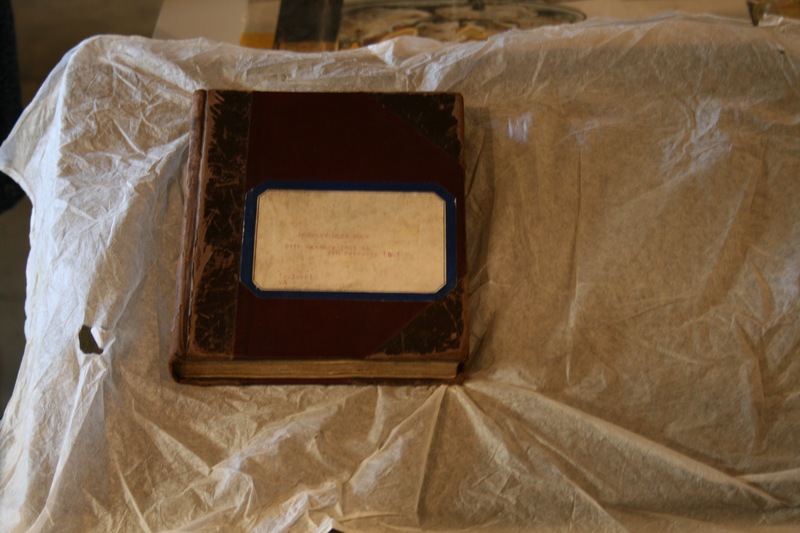 Colgan has been working in the archive for the past 14 years and definitely knows her Guinness history from the large amount of material that has been collected over the years. If stretched from end to end there would be 5 miles worth of historical papers from Guinness, pretty impressive. From the time spent with Colgan, which wasn’t enough, the group learned many interesting facts about the founder himself. Arthur Guinness was born south of Dublin most likely in 1725; there was no record of his actual birth date. It was his father that taught him the craft of brewing. 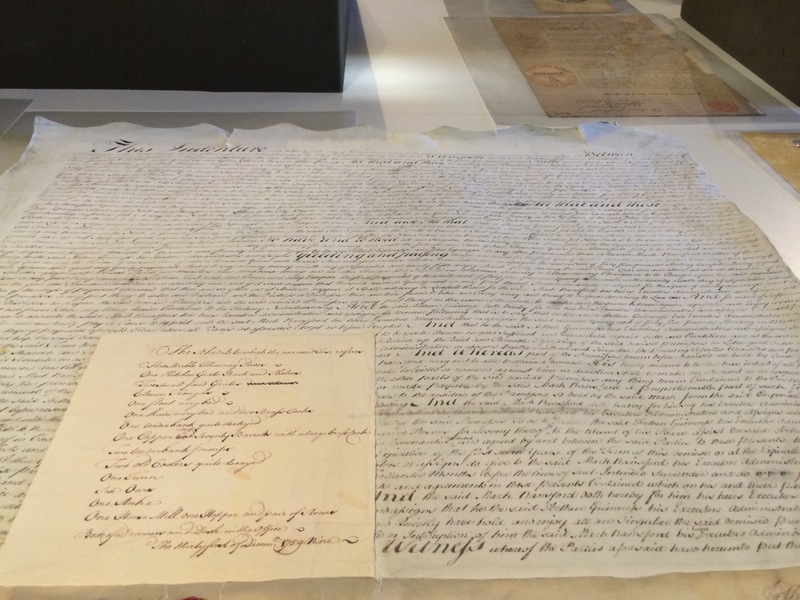 When Arthur signed the famous 9,000-year lease in 1759, his first beer brewed was Dublin Ale, not the Dry Irish Stout that his brewery is known for across the globe. He soon began brewing a Porter to keep his sales in line to what the public was drinking. 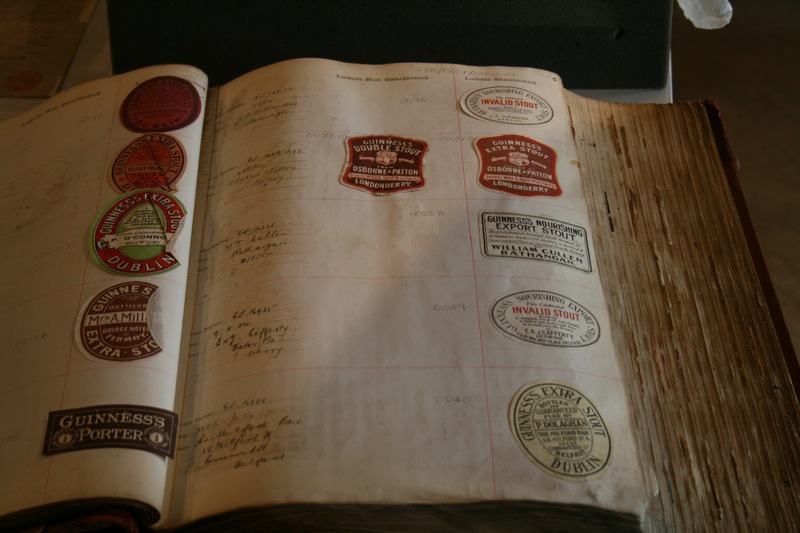 Guinness Label Archive Book that maintains its labels throughout its 257 year history. Portland, Oregon is mentioned in a Guinness “World Traveller” logbook, and yes that is two “L’s”. This was at a time when Guinness hired Arthur T. Shand to travel the United States and Canada to inspect the local bottling done by agents of Guinness. 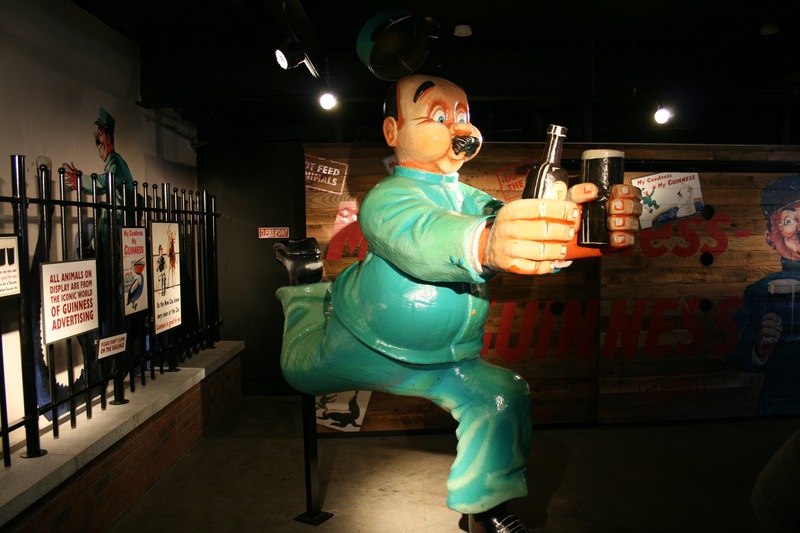 Prior to Guinness packaging its own beer in bottles, the brewery hired fillers in locales across the globe. Arthur’s famous signature that graces this historic 9,000 year lease adorns all of Guinness’ packaging on bottles and cans. This signature on the label began in 1862 when the brewery also included the famous harp, known as a Brian Boru Harp. Guinness was wise and trademarked the harp and signature in 1876. The harp is also a symbol of the Irish Free State Government but it had to turn the harp the other way so it would not interfere with the trademarked harp from Guinness. 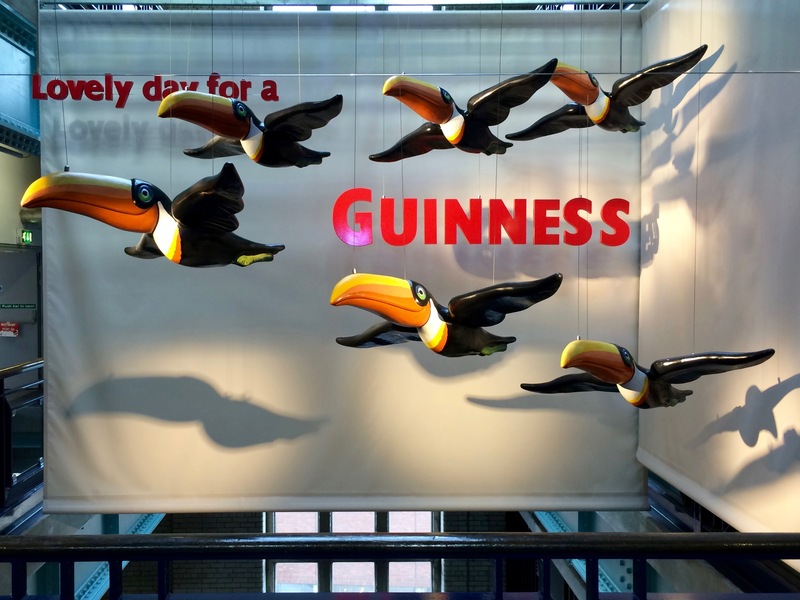 Guinness Toucans flying inside the Guinness Storehouse. 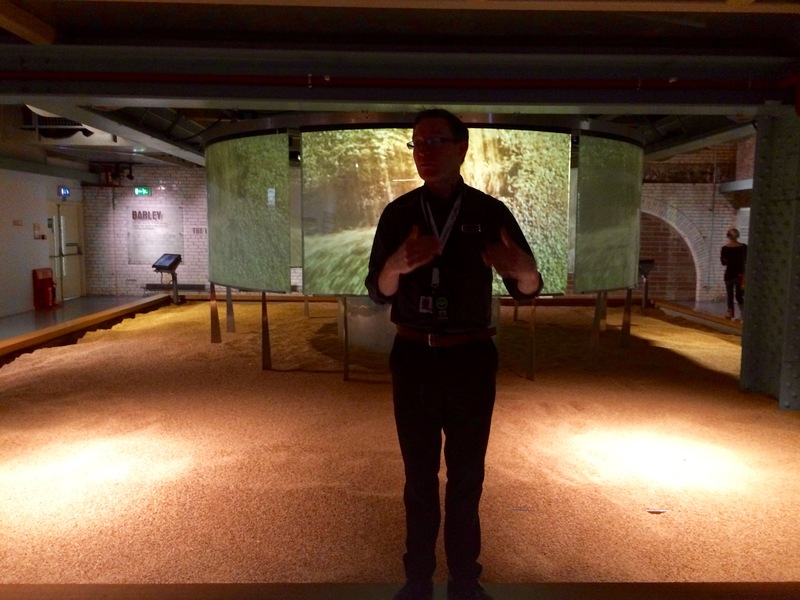 Other areas of the Storehouse show how Guinness is brewed. This is as close as one will get to see the production brewery as Guinness seems to keep that side of things off limits. During this visit Alan Maxwell led the group through the process that begins on the third floor and ends on the fourth floor. The brewing part of the tour begins with the barley used by Guinness. The brewery purchases 100,000 tons of Irish grown barley. Ten percent of the barley received is roasted. 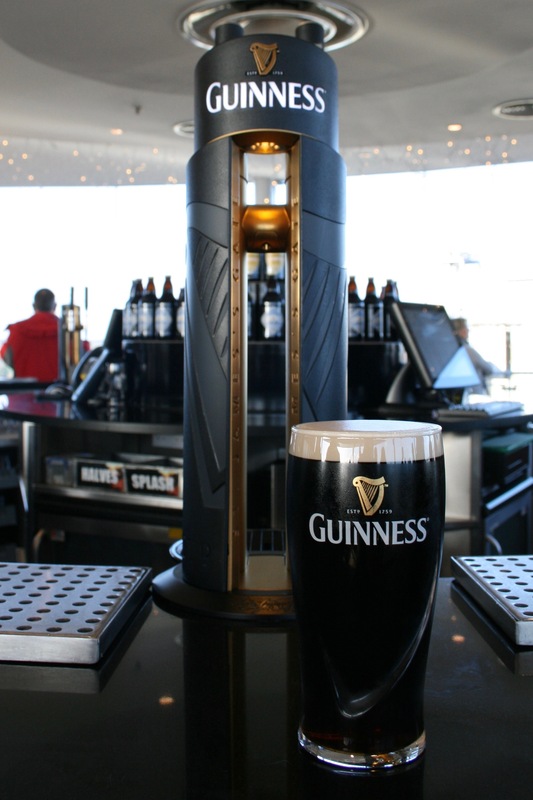 Then the yeast that Guinness uses is still derived from the original yeast strain that dates back to 1759. Then there’s the water source for Guinness. 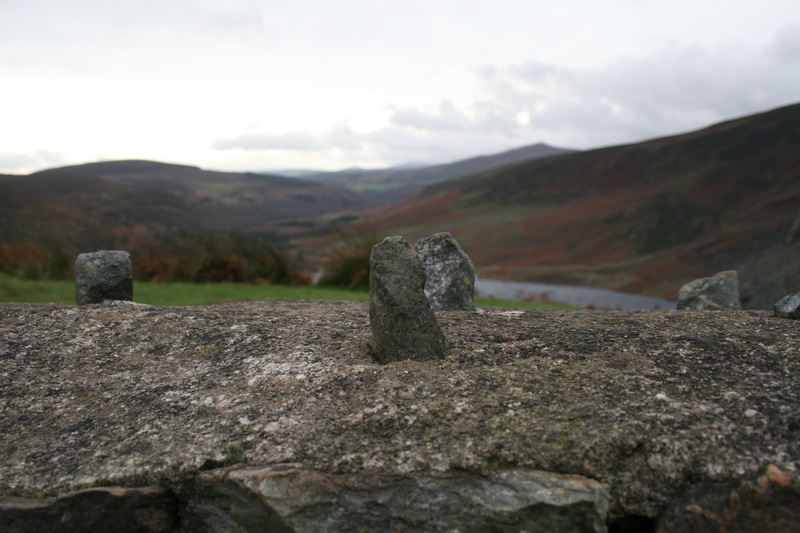 The Wicklow Mountains sit just south of Dublin and is the water source for Guinness. It’s here in the majestic mountains that have proven to be popular filming location. A few films that have been shot in the Wicklow Mountains have been Brave Heart, Excalibur, P.S. I Love You, Leap Year and more. 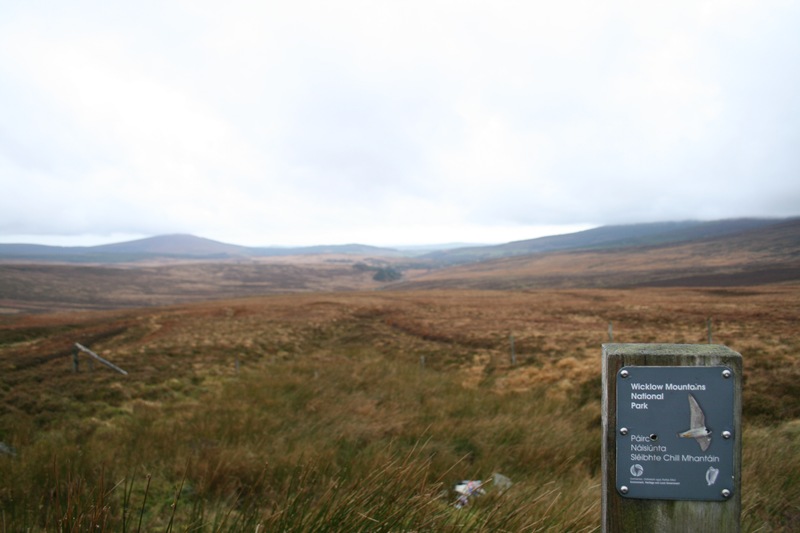 Wicklow Mountains outside of Dublin where Guinness receives its fresh water supply from. Moving on up the top floor of the Storehouse sits the Gravity Bar. This is the highest bar in all of Dublin. Gravity Bar offers up a magnificent 360-degree view of Dublin and beyond. Once up top at the Gravity Bar it becomes quite evident that Dublin is absent of many tall buildings. 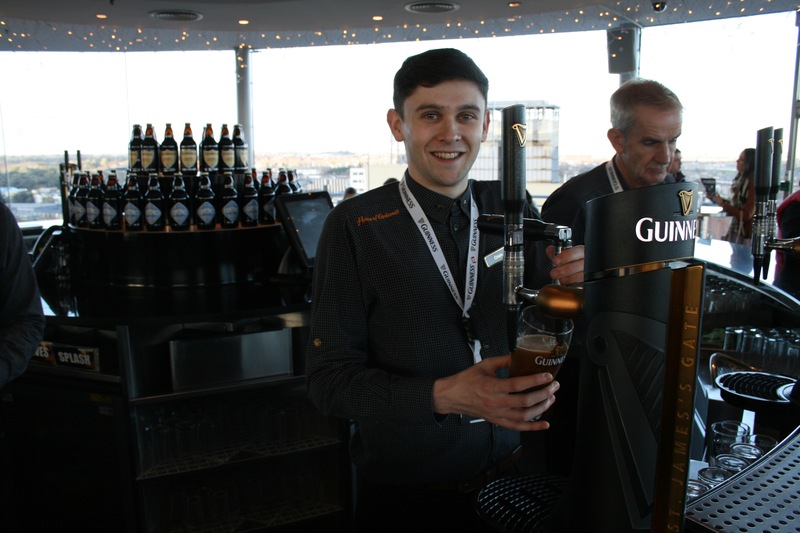 Here at the Gravity Bar it’s a perfect location to take in and discuss what was seen in the Guinness Storehouse while enjoying a perfectly poured Guinness. To assist in doing so, “You’re doing it right if you have a Guinness mustache,” stated Maxwell. Also make sure to exhale through your nose to get the full effect. Watching my first pour of Guinness take place at the Gravity Bar. From enjoying many pints of Guinness while in Ireland it was noticed that the hop profile was a bit more pronounced. This is the benefit of drinking a beer when it’s very fresh. Unfortunately what we end up with here in the Pacific Northwest has a hop profile that has tamed down but is shipped here much more quickly than it was a decade or more ago. 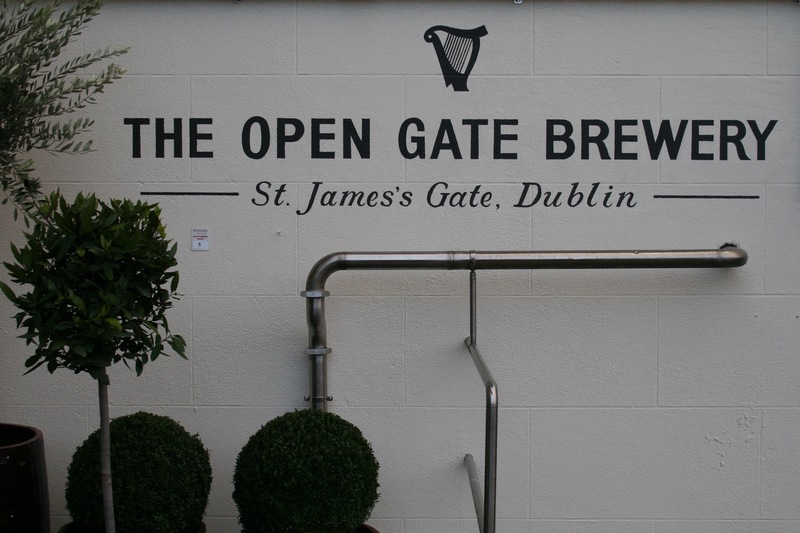 Welcome to The Open Gate Brewery – St. James’s Gate at Guinness. The most recent addition at St. James’s Gate for the opening of The Open Gate Brewery that has recently opened to the public with very limited hours of Thursday and Friday evenings. However this research and development brewery has been in operation at St. James Gate for around a century. 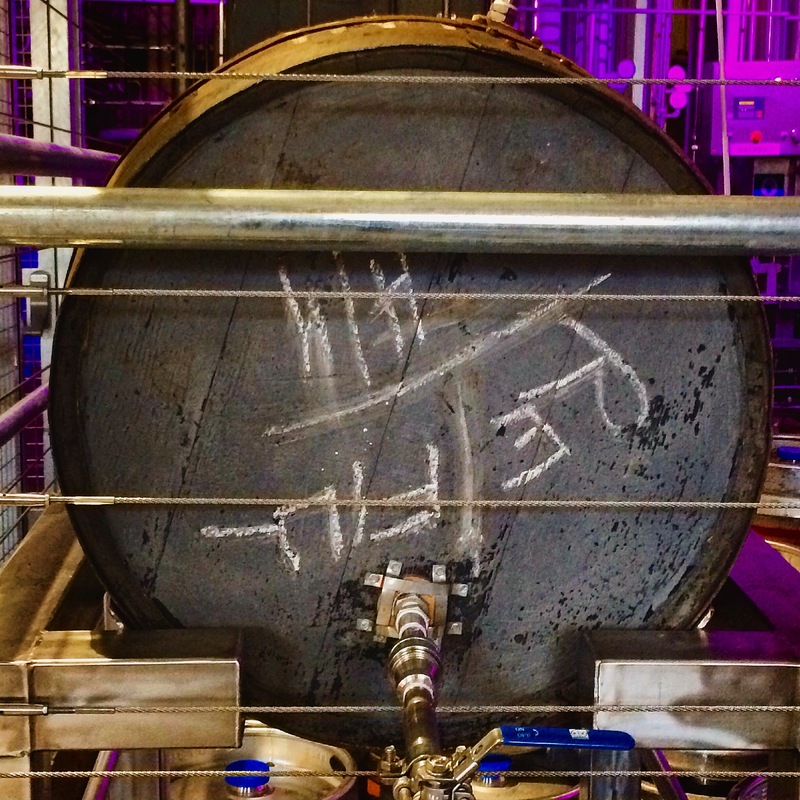 The Open Gate Brewery creates small batch, innovative beers on its 10 HL brewhouse while using 40 HL Tanks. For a brewery of this size it’s amazing that Guinness chooses to brew at this small of scale. But as the American craft brewing trend moves overseas its wise that Guinness has chosen to go in this direction with its creativity. 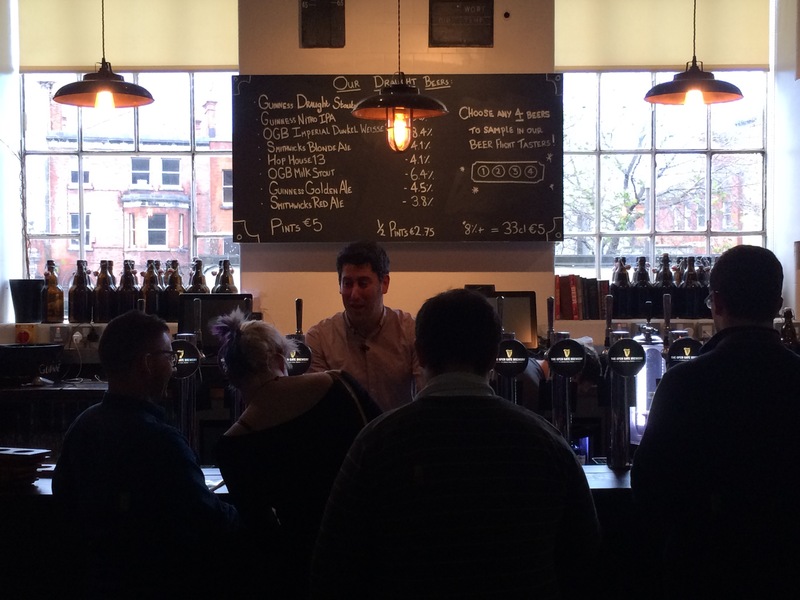 A look at The Open Gate Brewery at St. James’s Gate while visiting Guinness. The Open Gate it’s a perfect spot to order up a four-beer taster tray. 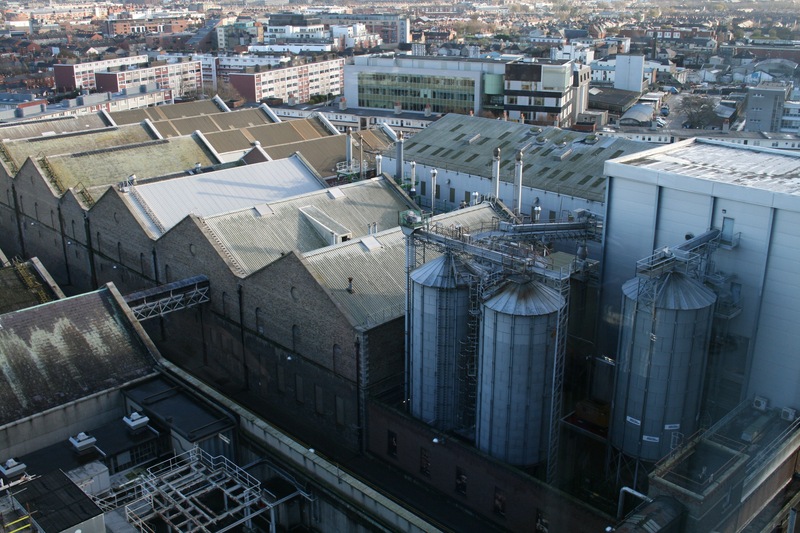 This is the brewery where one can find some rare beers from the highly skilled brewers at Guinness. During my visit I had the opportunity to speak to Peter Simpson and Jason Carroll, two of the brewers at The Open Gate. 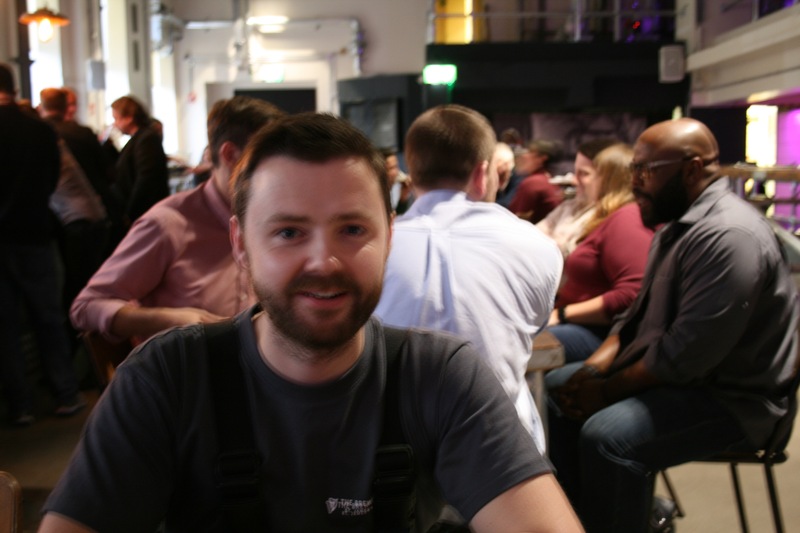 Carroll recently left his senior brewing position at Irish craft brewer Franciscan Well to take a position at Guinness. 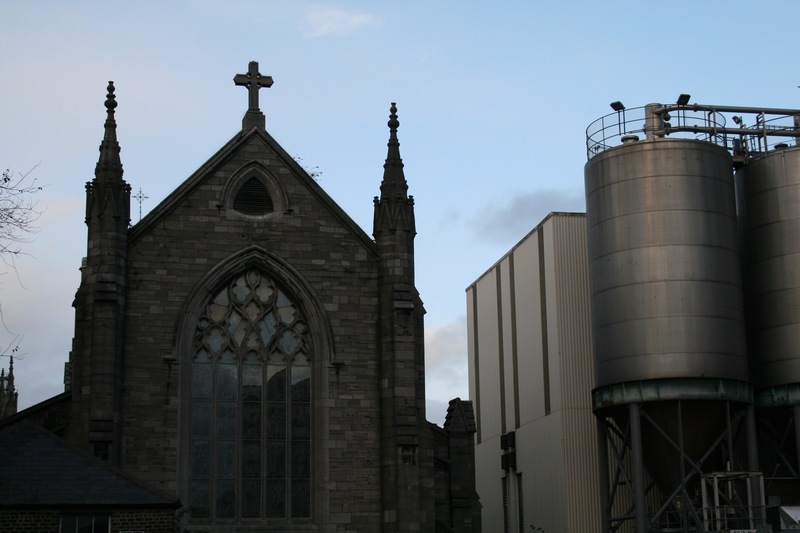 Franciscan Well is the brewery that was part of the Jameson Caskmates Irish Whiskey – Stout Edition release. This team of brewers at The Open Gate Brewery is part of “The Brewers Project”. It’s here where any new beer begins before ever going into the marketplace anywhere around the globe. One of the more unique beers pouring was its Barrel Beer. This barrel-aged beer was a Strong Ale that was aged in a Johnnie Walker Scotch Whisky Barrel. 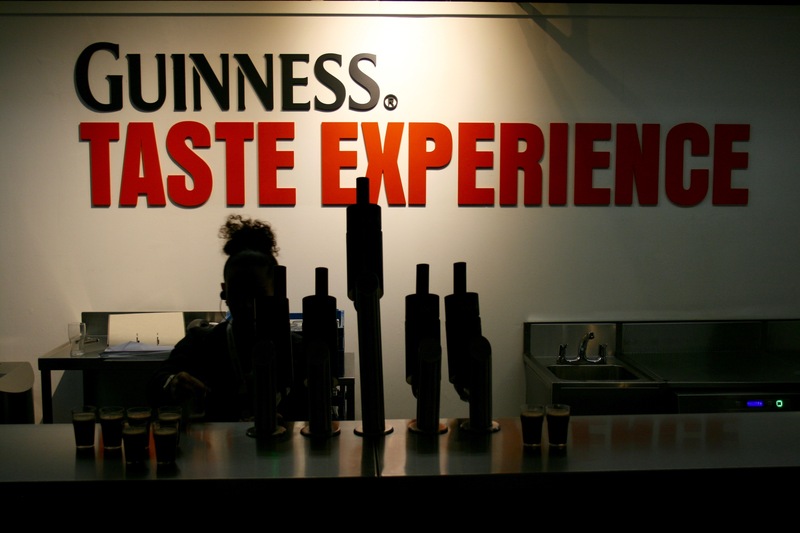 Being a sister company in the Diageo portfolio of brands, Guinness is in much better position to have access to these barrels. 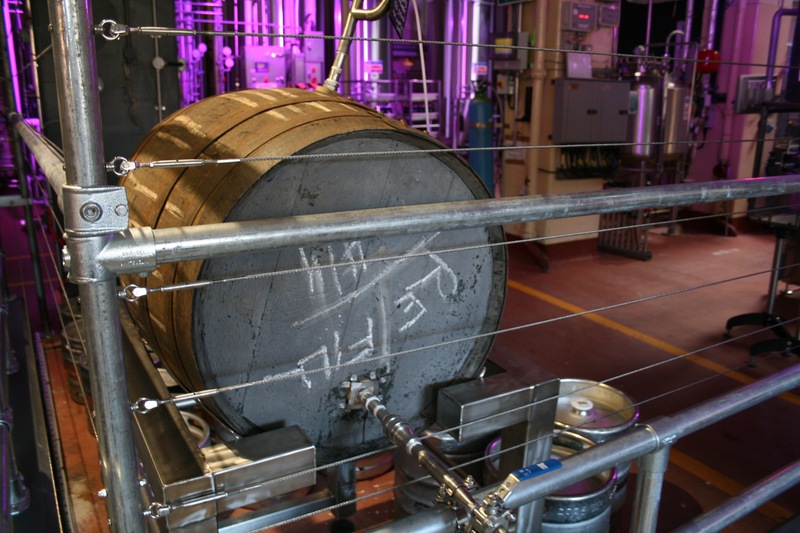 Prior to entering the barrel the Strong Ale was at 6.4% ABV. One week later after resting in the barrel the beer’s ABV increased to 7.4%. Barrel Aging in a previously used Johnnie Walker Barrel inside The Open Gate Brewery. 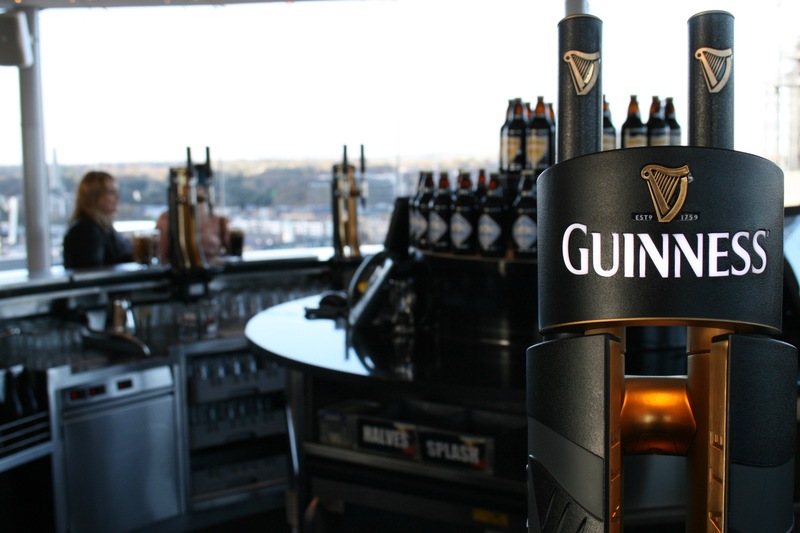 Over at the Guinness production brewery at St. James’s Gate, the brewery brewed 4.5 million HL (2.8 million BBL) of beer. This does not even count the amount of beer that is brewed on behalf of Guinness at its numerous breweries around the globe that brew its beers on a license basis. Not surprisingly Guinness is the largest brewer of stout in the world. 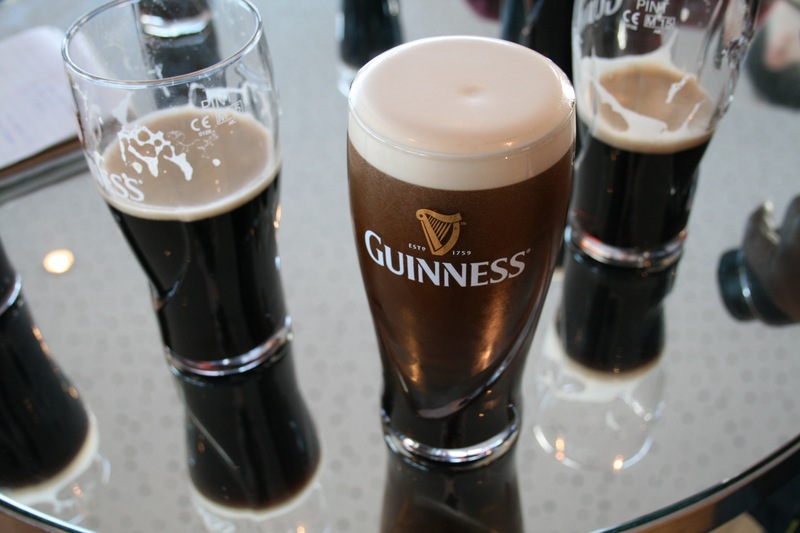 Here in the United States Guinness offers about eight different varieties of beers. 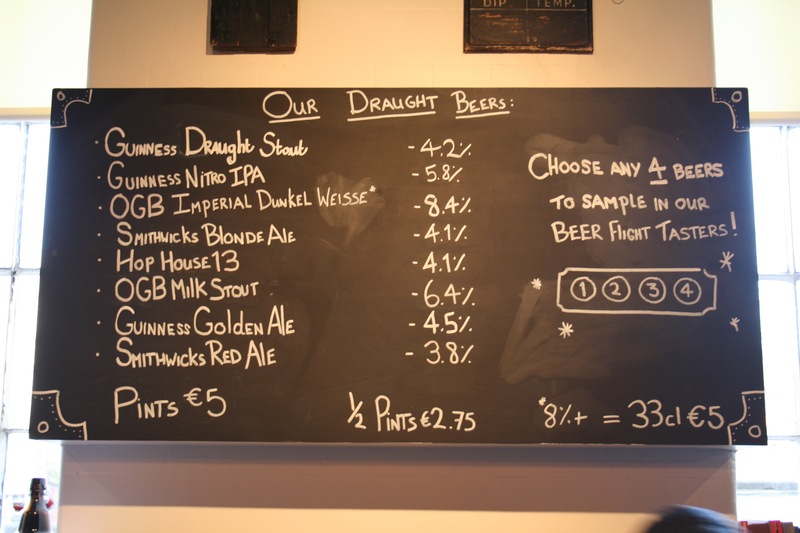 These offerings include Draught, Extra Stout, Nitro IPA, Blonde American Lager, Black Lager, Foreign Extra Stout, and the two new to our market Dublin Porter and West Indies Porter. All of these beers except for the Blonde Amerocan Lager are brewed at St. James’s Gate in Dublin. Outside of the U.S. the brewery’s offerings are more varied based on the market its in. A few of these varieties include Bitter, Extra Smooth, Mid-Strength, and Red Harvest Stout. Bottles of Guinness West Indies Porter and Guinness Dublin Porter inside the Guinness Archives alongside Guinness The 1759 bottle. The two latest offerings to this the States from Guinness are its West Indies Porter and Dublin Porter, that are part of The Brewers Project. During the visit to Guinness these two re-launched beers were served while tasting various Guinness offerings in the Guinness Connoisseur Bar. Both beers are based on recipes found in the historic brewer logbooks that Colgan maintains in the Guinness Archives. 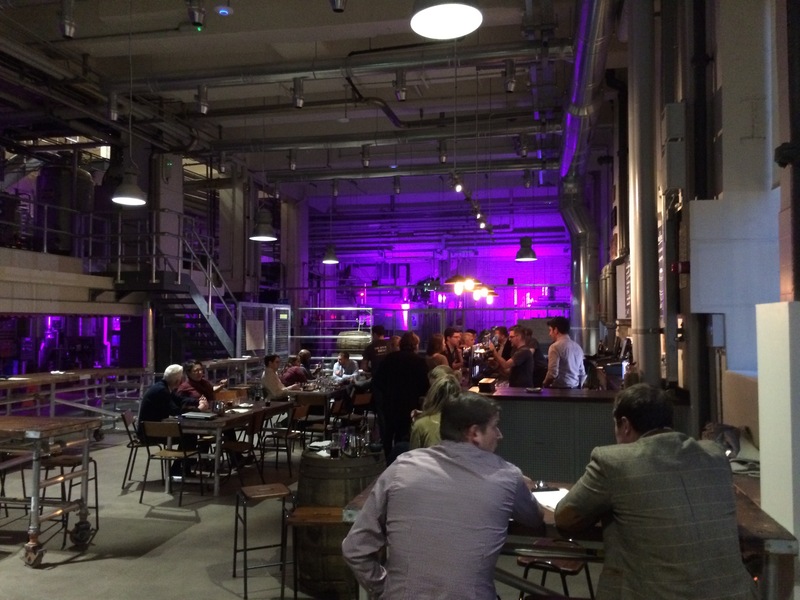 Part of The Brewers Project, Dublin Porter and West Indies Porter were developed inside The Open Gate Brewery. It’s here in the innovation brewery where the brewers brought back to life two historic beers for today’s beer drinkers. 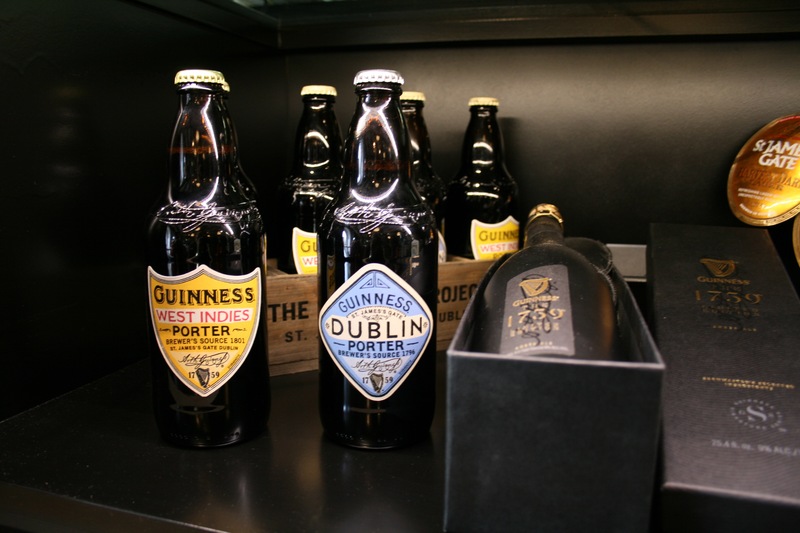 Dublin Porter and West Indies Porter were released a few years ago and sold exclusively for Ireland and United Kingdom. Both beers are now available here in the States as part of The Brewers Project Pack 18 pack of 11.2 oz. bottles. Guinness Dublin Porter and Guinness West Indies Porter inside the Guinness Connoisseur Bar. Originally brewed in 1796, Dublin Porter was the result for the Dublin brewer to compete with the Porters being brewed in England. Guinness put an Irish spin on the style with a more caramel flavor. Dublin Porter is a true Session Beer at only 3.8% ABV. 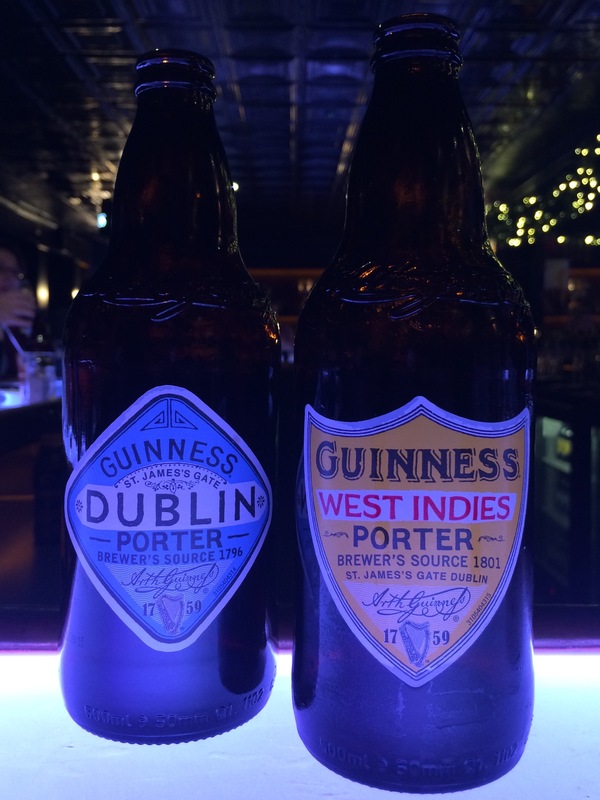 West Indies Porter roots go back to 1801 when Guinness was shipping its beers for long trips across the ocean. Compared to the Dublin Porter, this beer offers a much more robust flavor and chocolate notes with a 6% ABV. It is this beer that the well respected Guinness Foreign Extra Stout is base on. 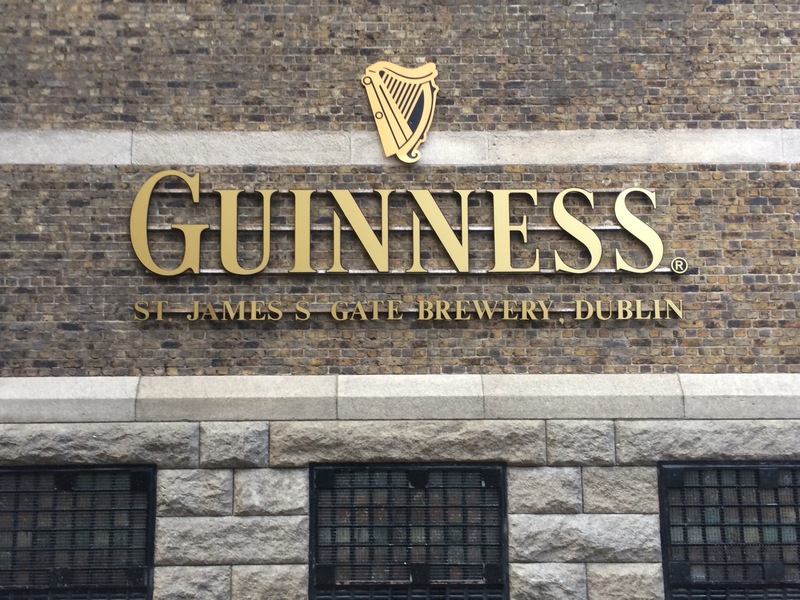 Traveling to Dublin was a memorable experience and to visit the home of Guinness made it that much more special. Learning about the history of this iconic brand was a true highlight. Now I just need to return to learn and experience more of what Ireland has to offer. Here are more photos from the trip to Dublin, Ireland and St. James’s Gate. 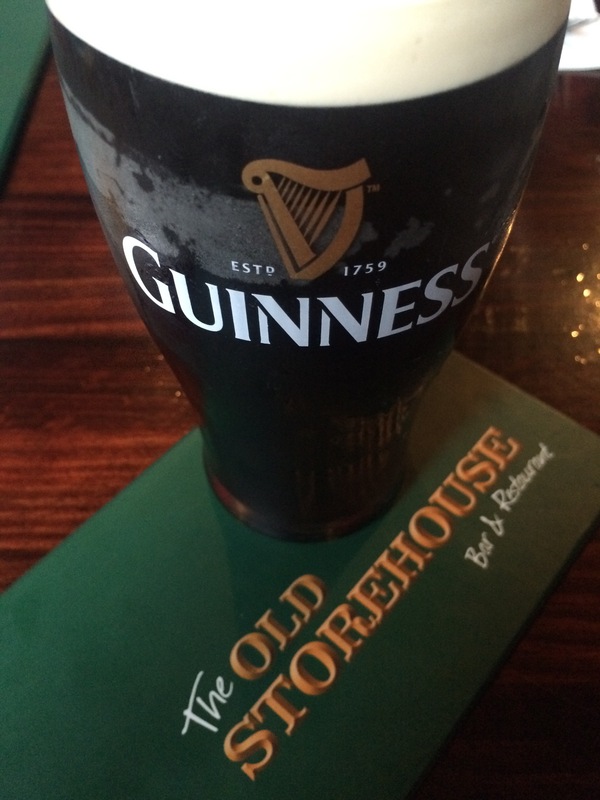 My first Guinness during my trip to Dublin took place at The Old Storehouse in Dublin, Ireland. The old brick that makes up the Guinness property in Dublin, Ireland. Outside of the Guinness Storehouse in Dublin, Ireland. 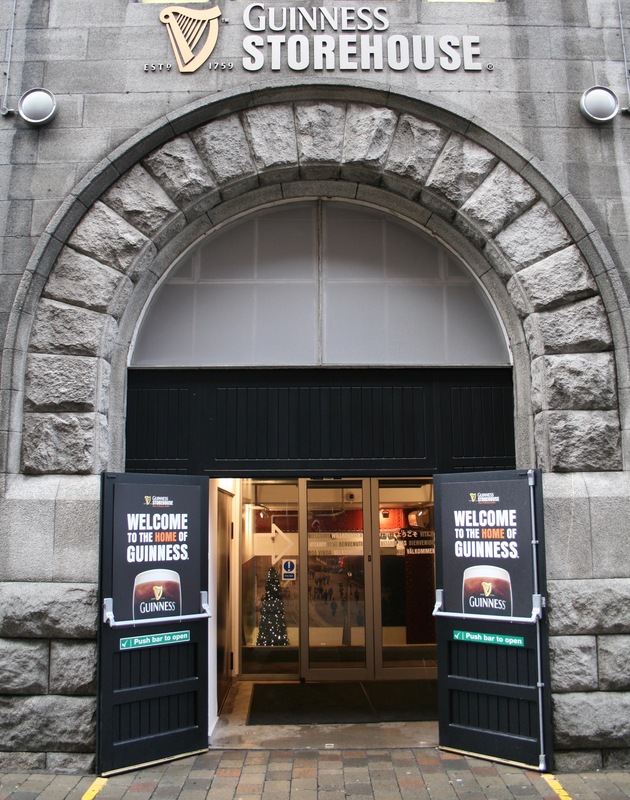 Guinness Storehouse Entrance that leads you into 7 floors of fun! 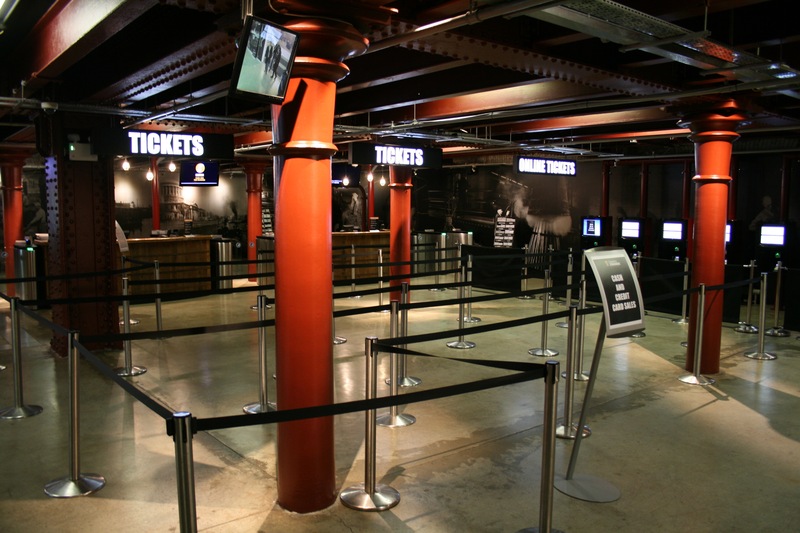 First floor of the Guinness Storehouse where entry tickets can be purchased. 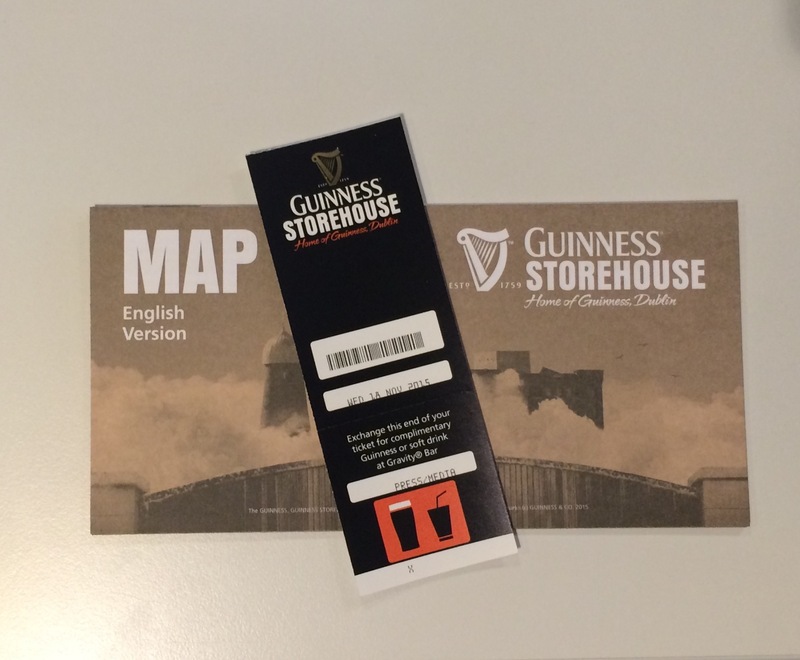 Ready to conquer the Guinness Storehouse. 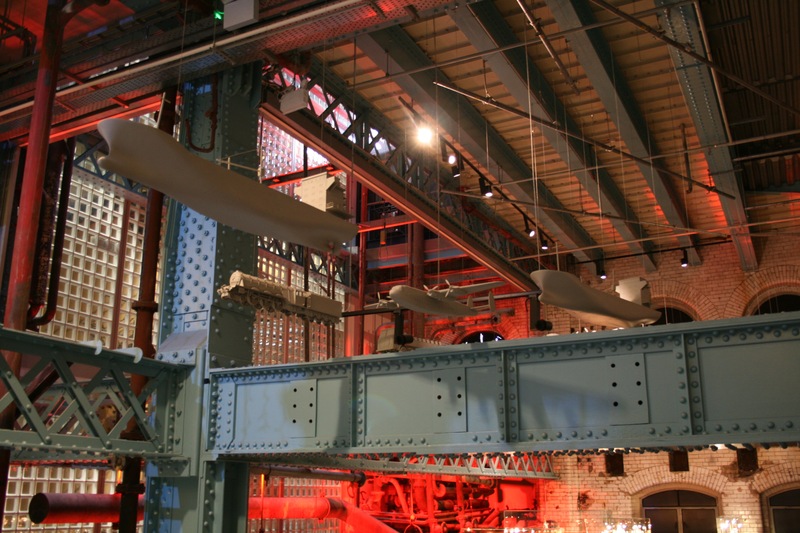 The old steel structure still stands as model replicas of the old Guinness fleet loom above at the Guinness Storehouse. 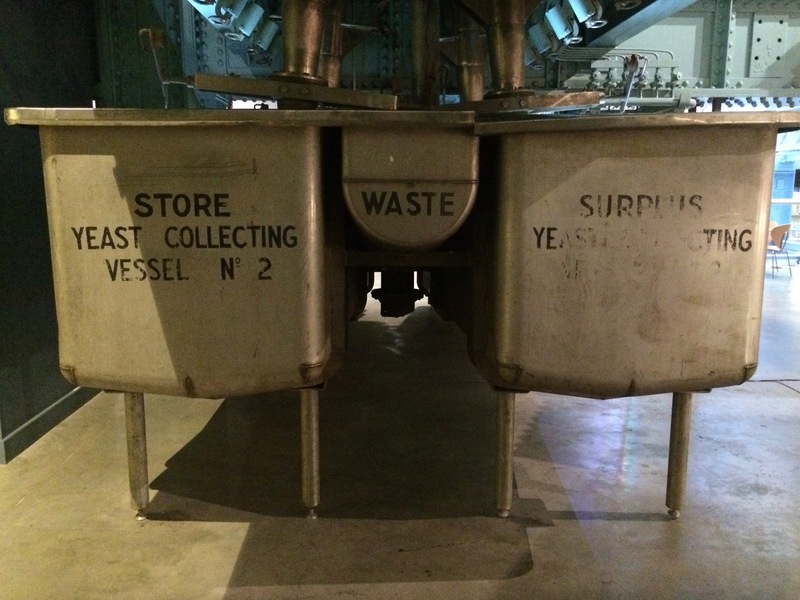 Guinness Yeast collecting vessel inside the Guinness Storehouse. 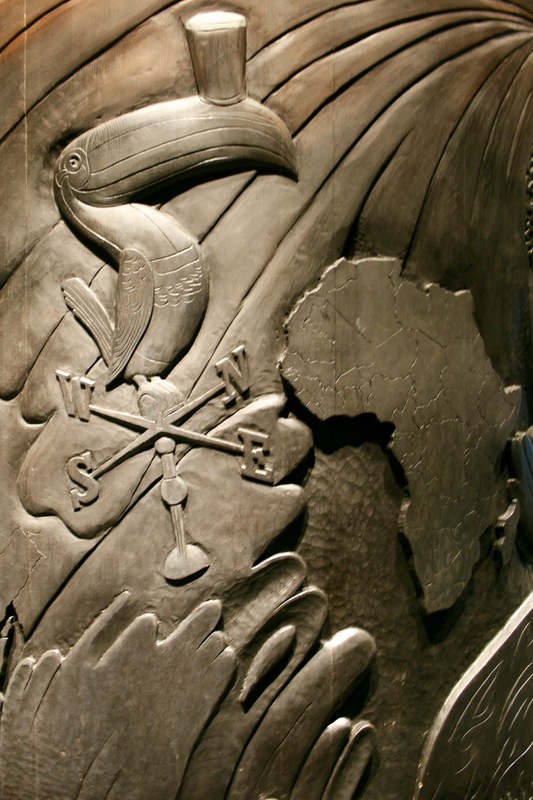 Guinness has traveled very far in its 257 years of existence. 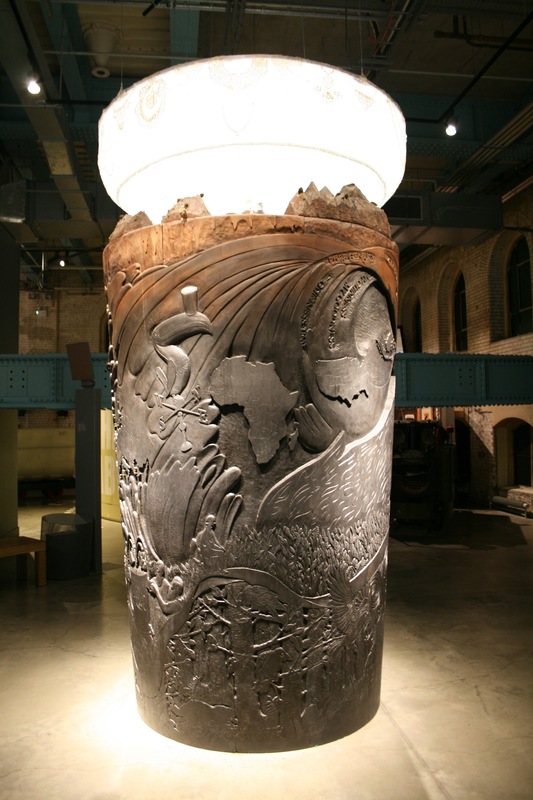 A steel sculpture of the Guinness advertising history at the Guinness Storehouse. 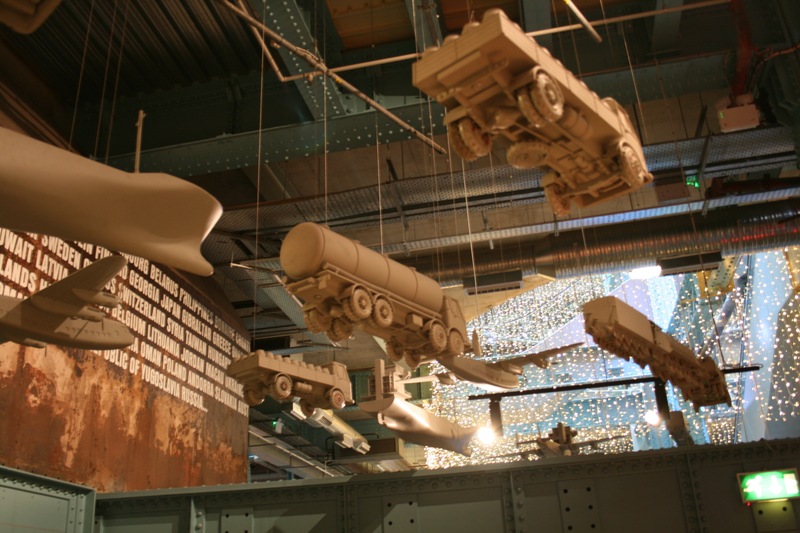 A replica of the historic Guinness fleet hangs overhead at the Guinness Storehouse. 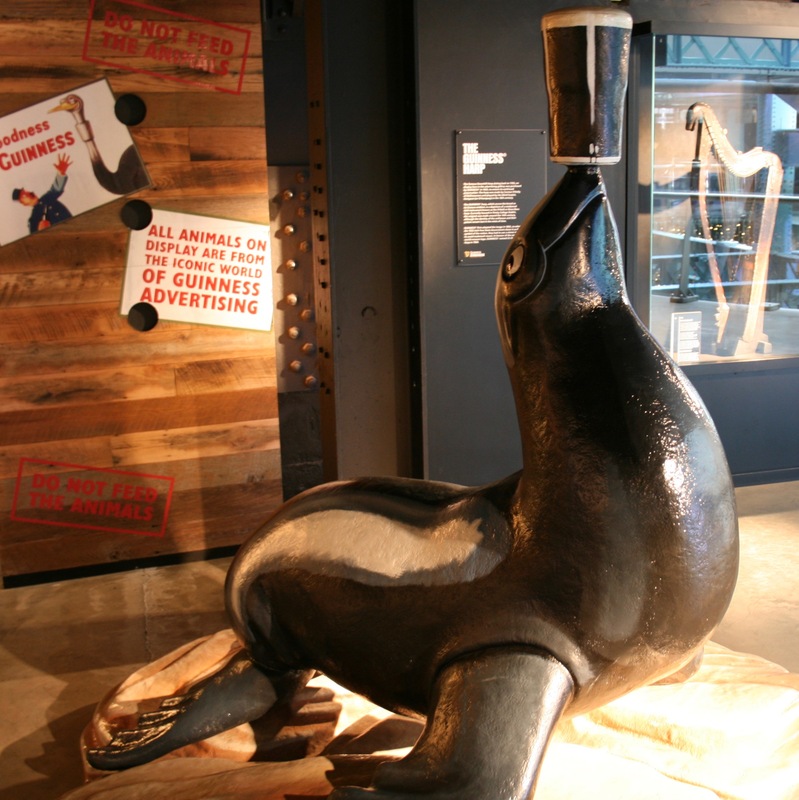 The famous Guinness Toucan on the Guinness advertising sculpture at the Guinness Storehouse. Of course there’s a gift shop at the Guinness Storehouse. Guinness Archivist, Eibhlin Colgan, showing the famous 9,000 Year Guinness lease. 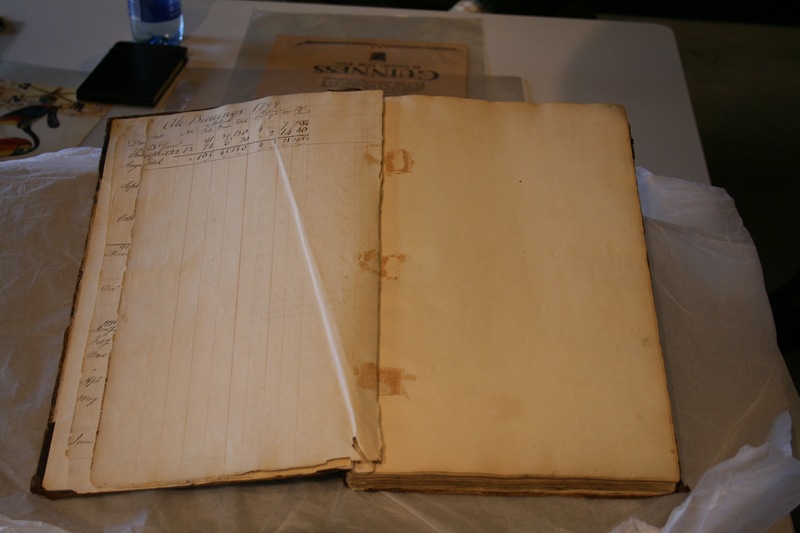 Guinness Brewers Logbook with pages from 1797. 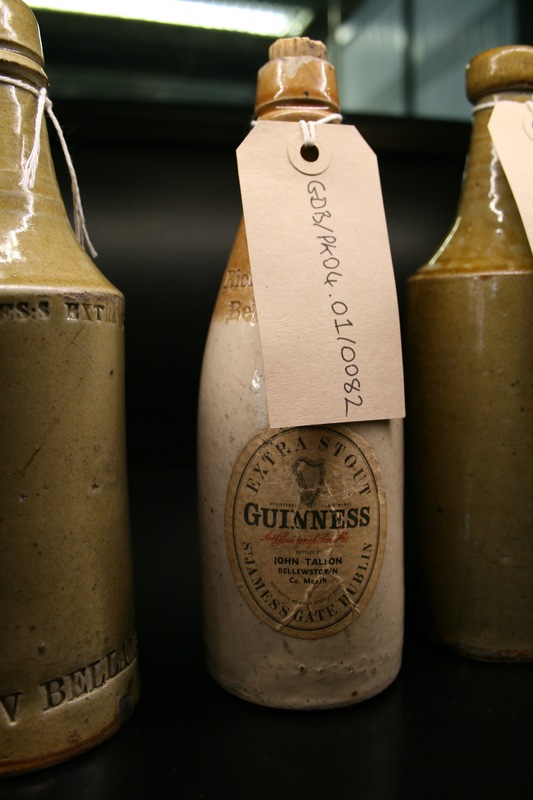 The last known recorded batch of Guinness Dublin Ale brewed in 1799. 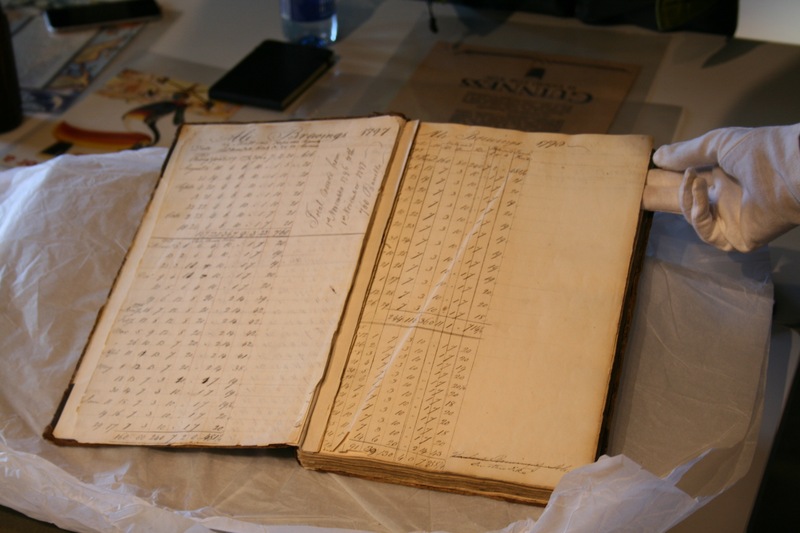 A Guinness Brewers Logbook that kept recipes from the early 1800’s. Ceramic Guinness bottle inside the Guinness Archives. 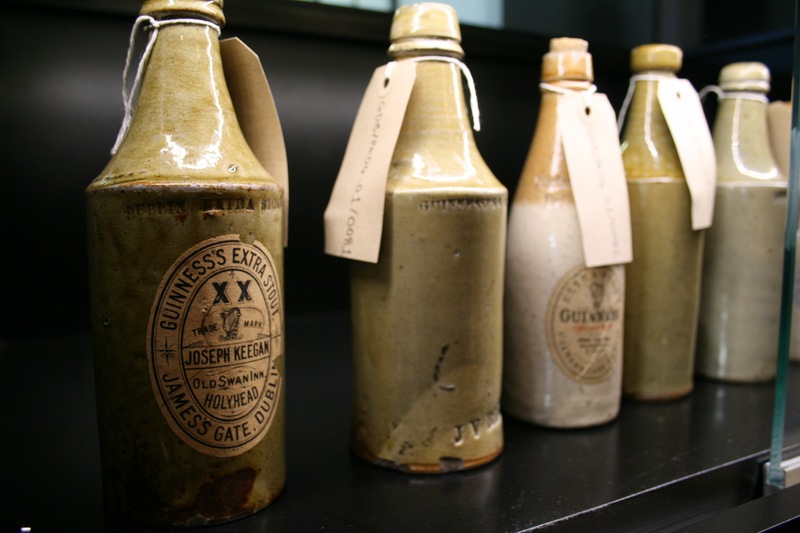 Old ceramic bottles of Guinness in the Guinness Archives. Alan Maxwell discussing how Guinness roasts its barley. 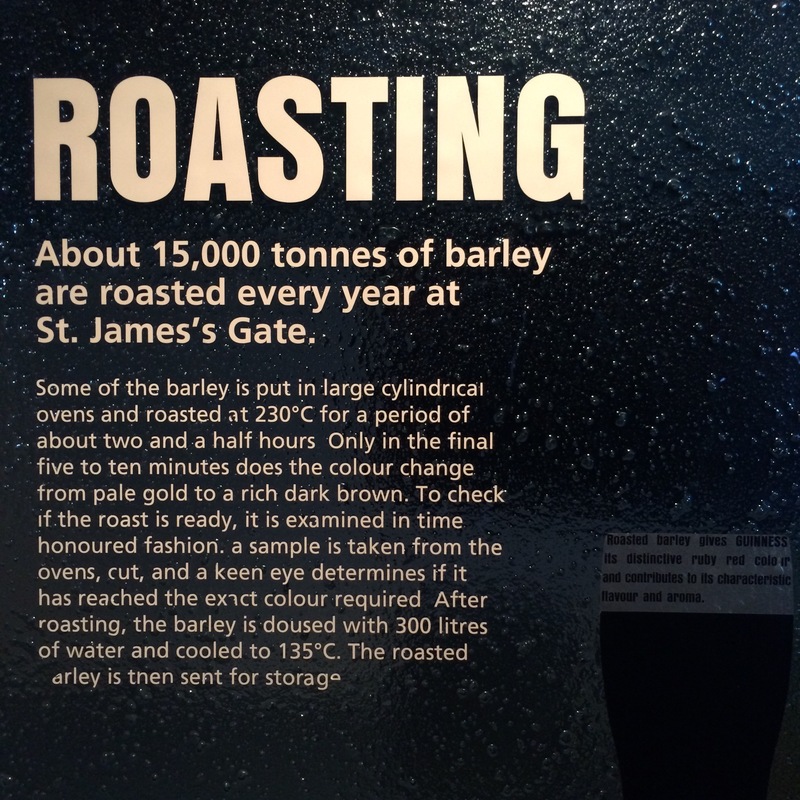 Barley Roasting information at the Guinness Storehouse. Used tanks inside the Guinness Storehouse. 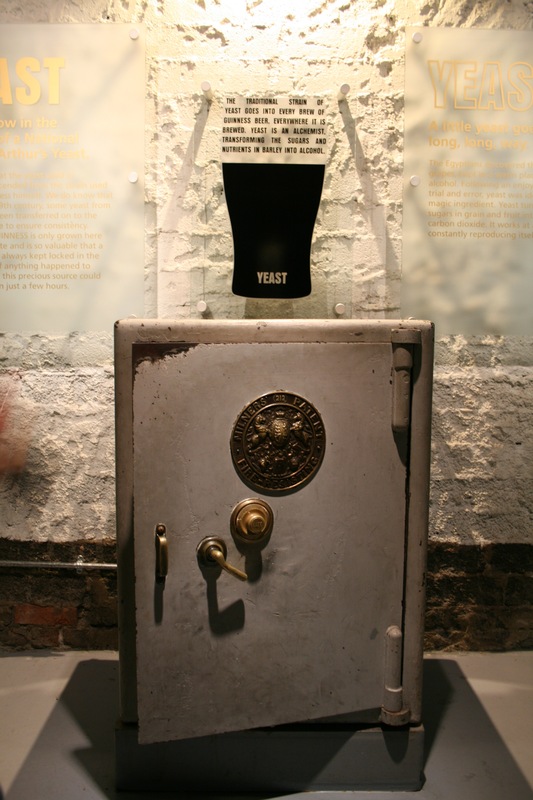 The vault that holds the Guinness Yeast inside the Guinness Storehouse. 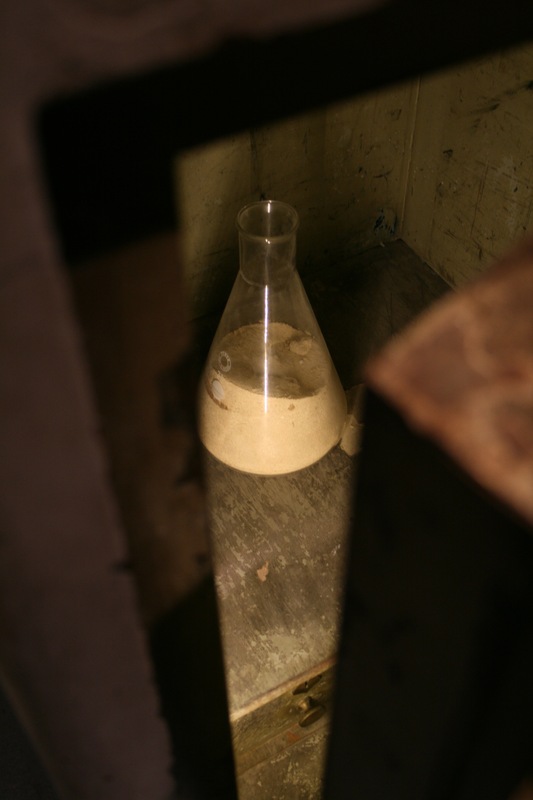 A bottle containing Guinness Yeast at the Guinness Storehouse. 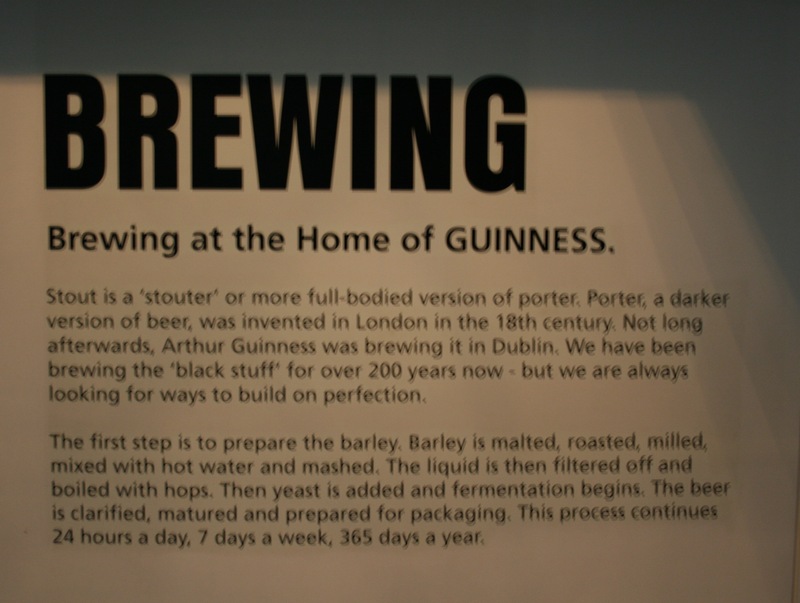 Brewing at the Guinness Storehouse. Alan Maxwell discussing the water source from the Wicklow Mountains that makes Guinness so special. The Guinness Taste Experience inside the Guinness Storehouse. 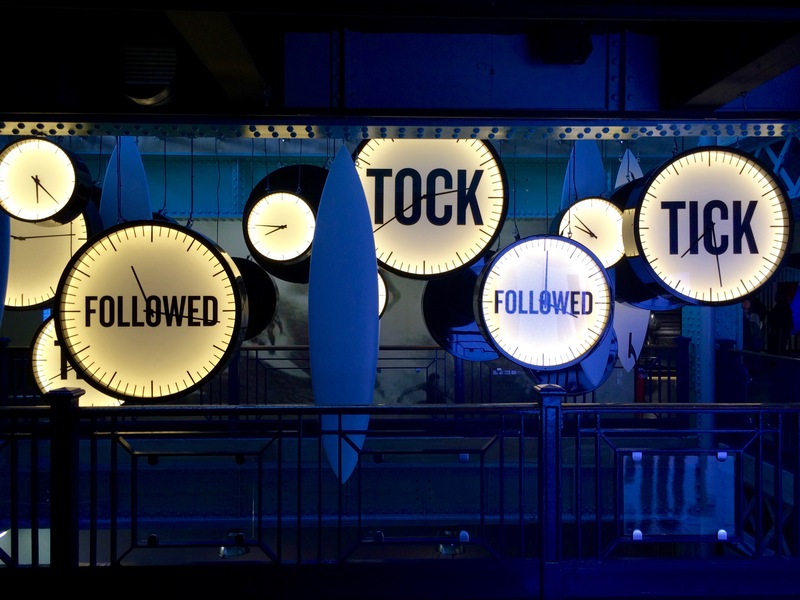 Tick Tock inside the Guinness Storehouse. 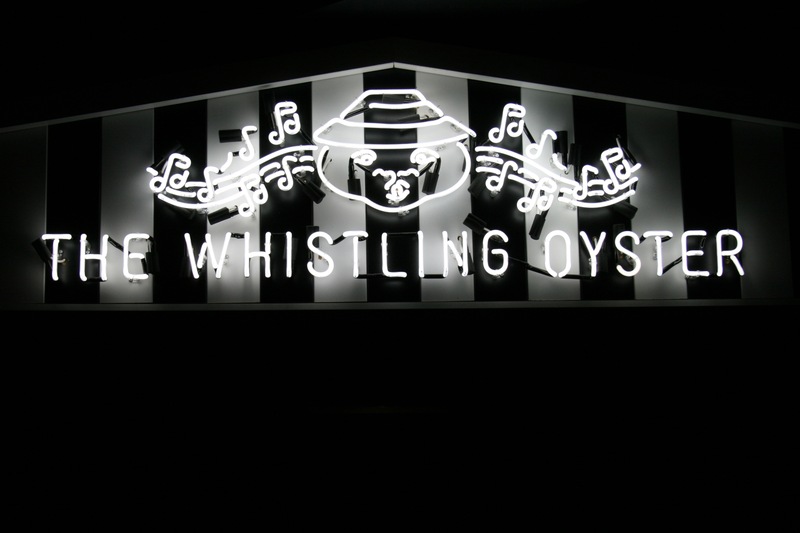 The Whistling Oyster inside the Guinness Storehouse. 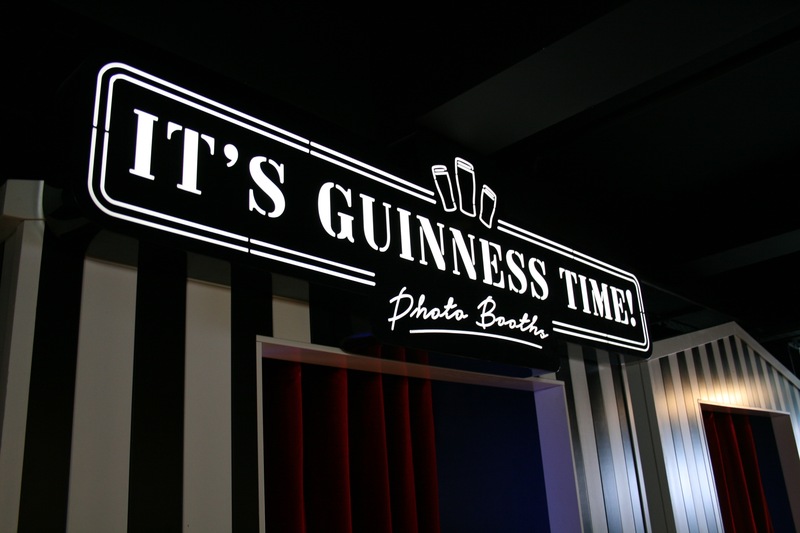 It’s Guinness Time Photo Booth inside the Guinness Storehouse! Guinness Zookeeper created by John Gilroy. 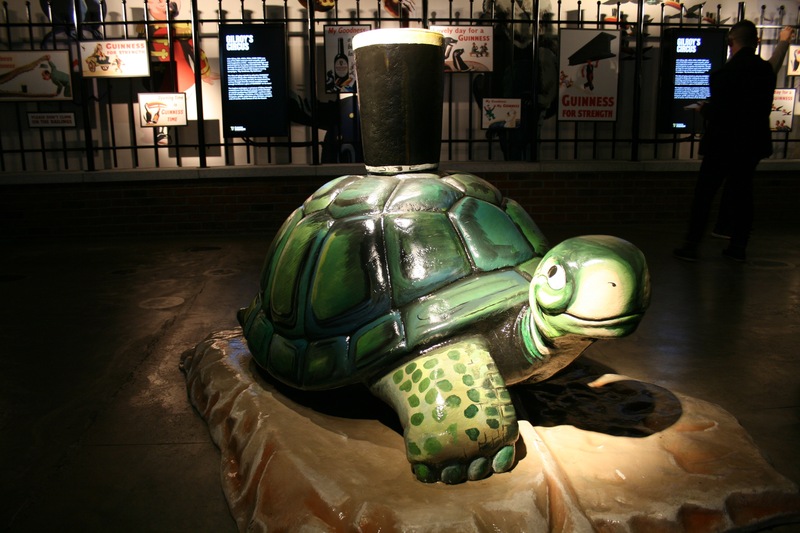 Guinness Turtle carrying a pint of Guinness created by John Gilroy. Guinness Seal created by John Gilroy. 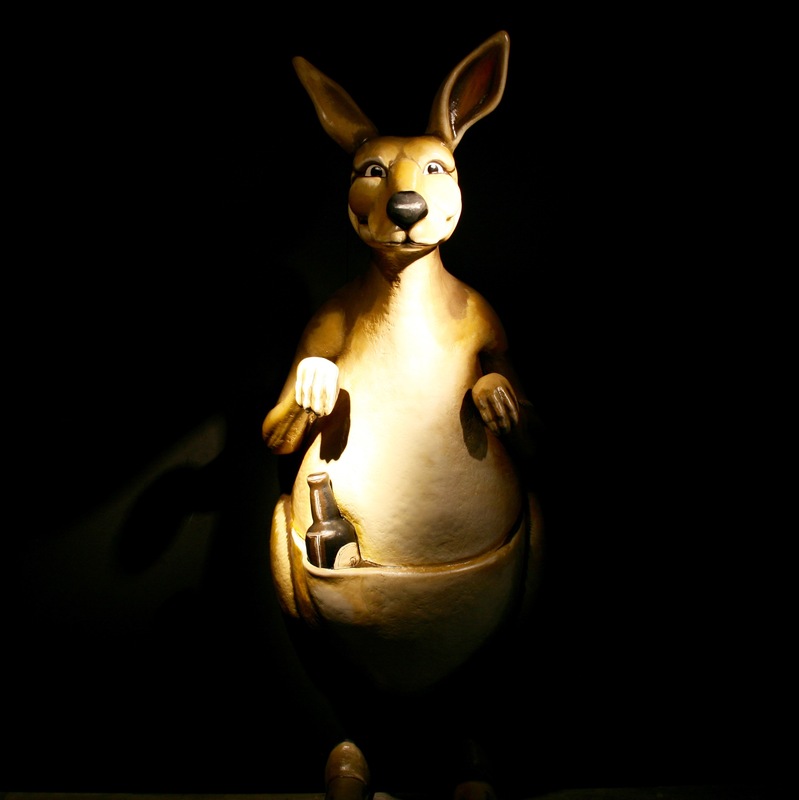 Guinness Kangaroo from John Gilroy. 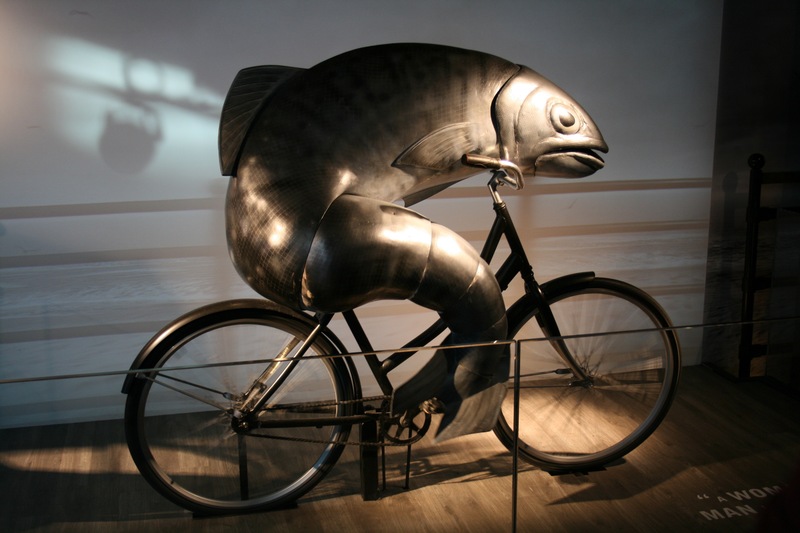 “A woman needs a man like a fish needs a bicycle.” – Patricia Irene Dunn at Guinness Storehouse. 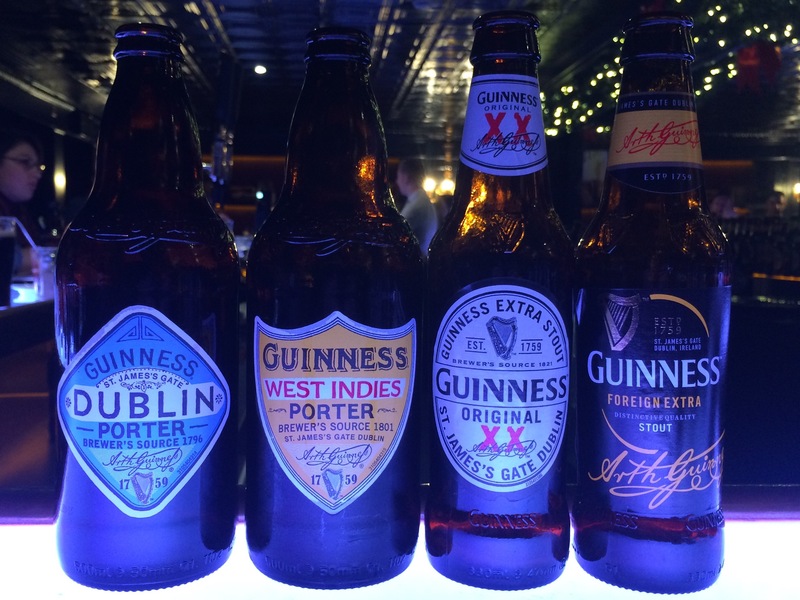 A perfect lineup of Guinness at the Guinness Connoisseur Bar featuring Dublin Porter, West Indies Porter, Extra Stout and Foreign Extra Stout. 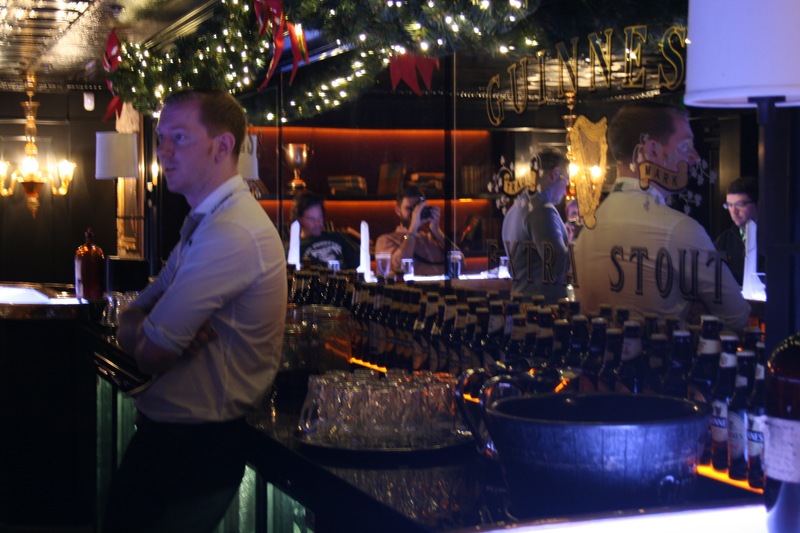 Domhnall Marnell holding court at the Guinness Connoisseur Bar. 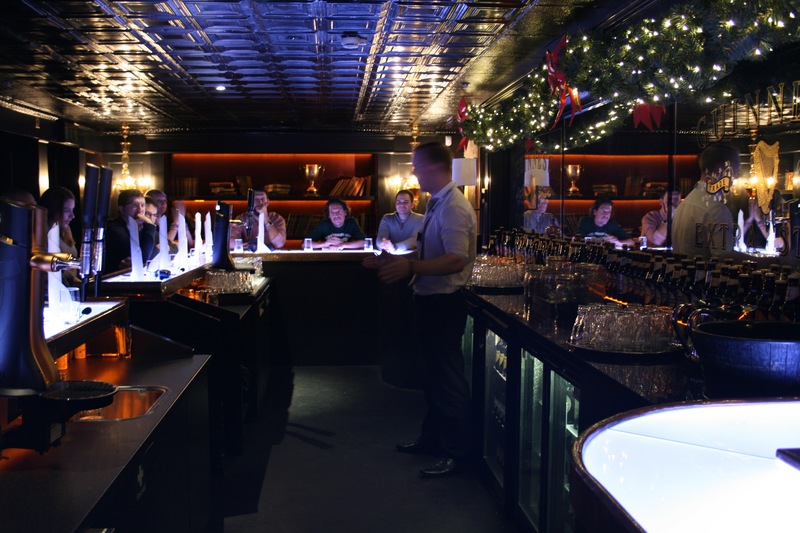 Learning to pour the perfect Guinness from Domhnall Marnell inside the Guinness Connoisseur Bar. 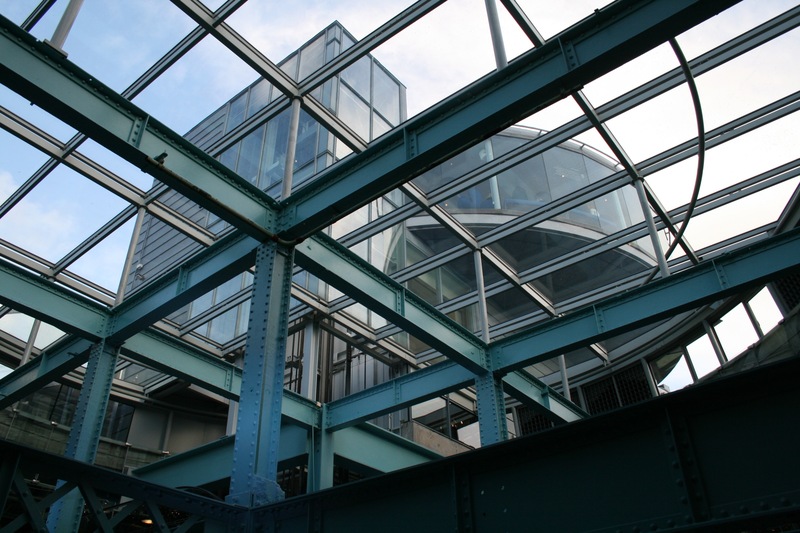 Looking up through the glass ceiling to the Guinness Gravity Bar while inside the Guinness Storehouse. The Gravity Bar atop the Guinness Storehouse. Guinness taps at the Gravity Bar atop the Guinness Storehouse. Guinness for many inside the Gravity Bar. Nice creamy head on a Guinness at the Gravity Bar. 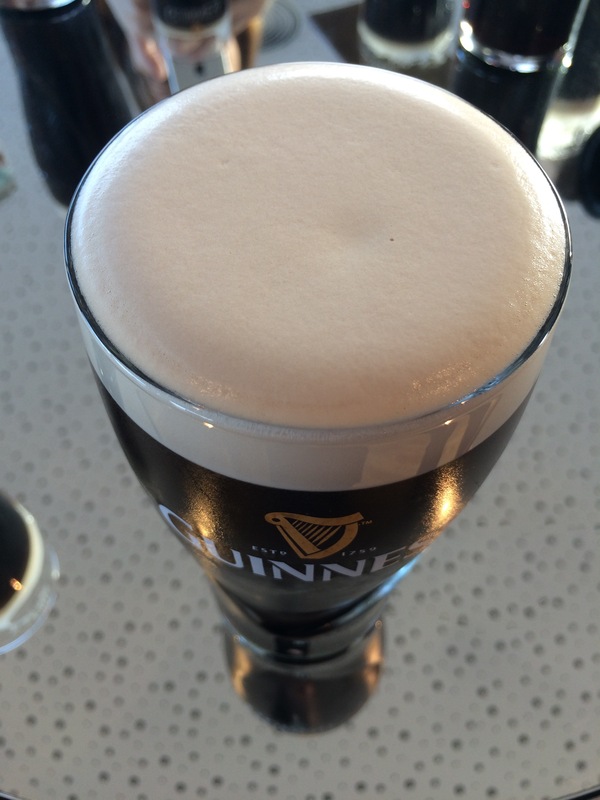 A beautifully poured Guinness at the Gravity Bar. 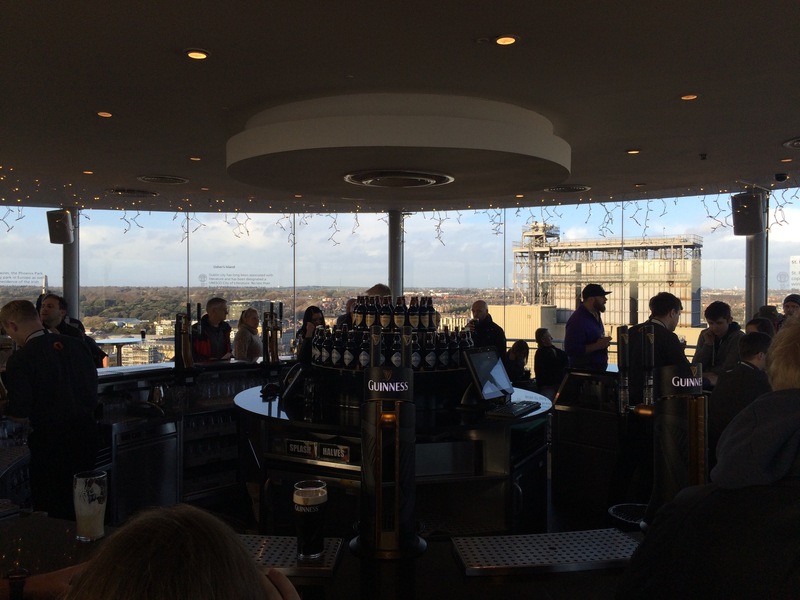 Enjoying a Guinness inside the Gravity Bar. Looking over the Guinness Brewery from the Gravity Bar. 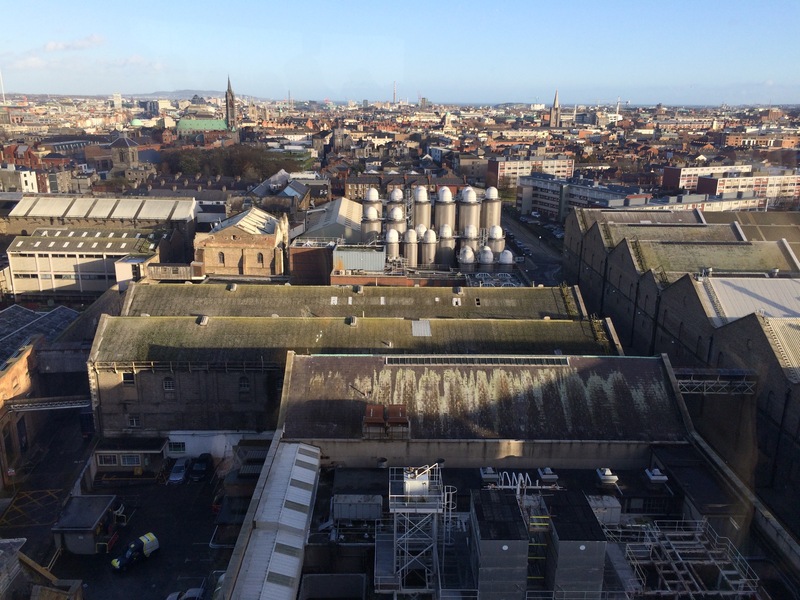 Another view of the Guinness Brewery from the Gravity Bar. 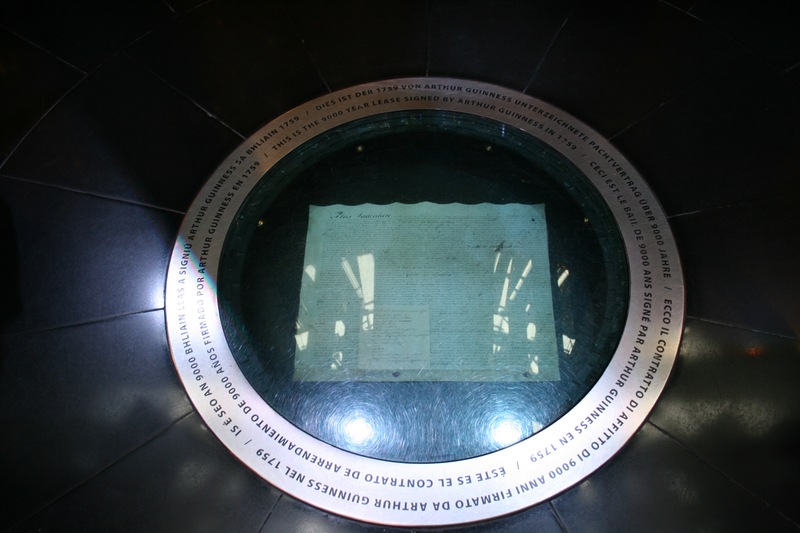 A copy of the famous Guinness 9,000 year lease in the floor at the Guinness Storehouse. 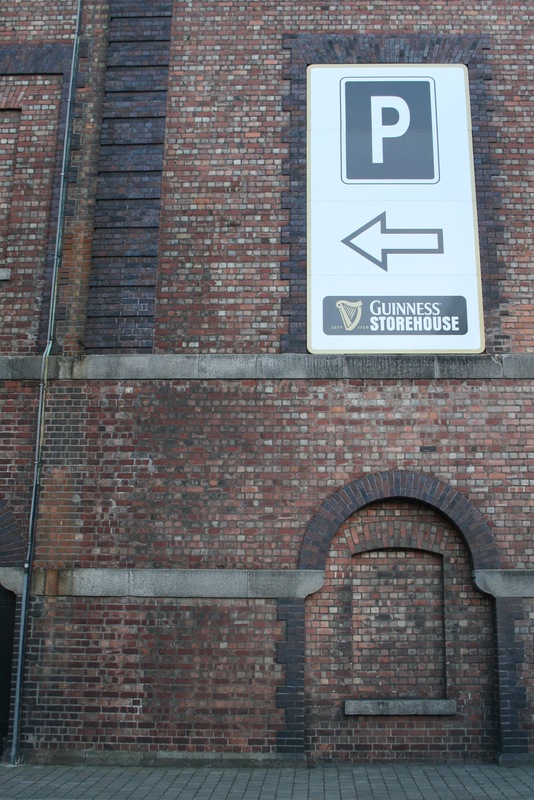 A gate at the Guinness Brewery in Dublin, Ireland. 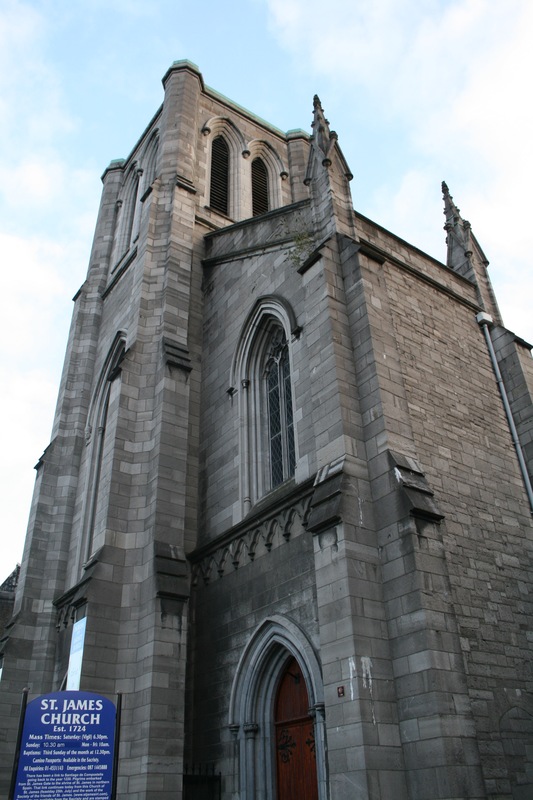 St. James Church sits next to the Guinness Brewery. St. James Church on the grounds of Guinness in Dublin, Ireland. 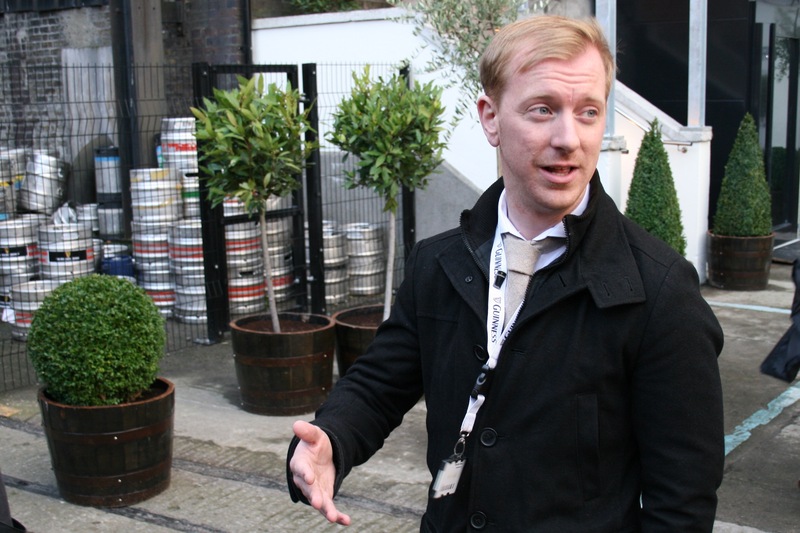 Domhnall Marnell leading us to The Open Gate Brewery at St. James’s Gate to drink more Guinness. 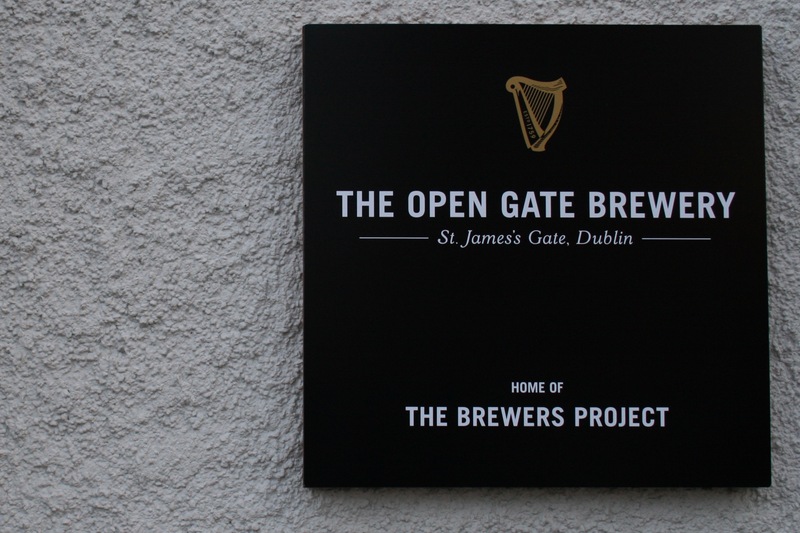 The Open Gate Brewery, Home of The Brewers Project from Guinness. 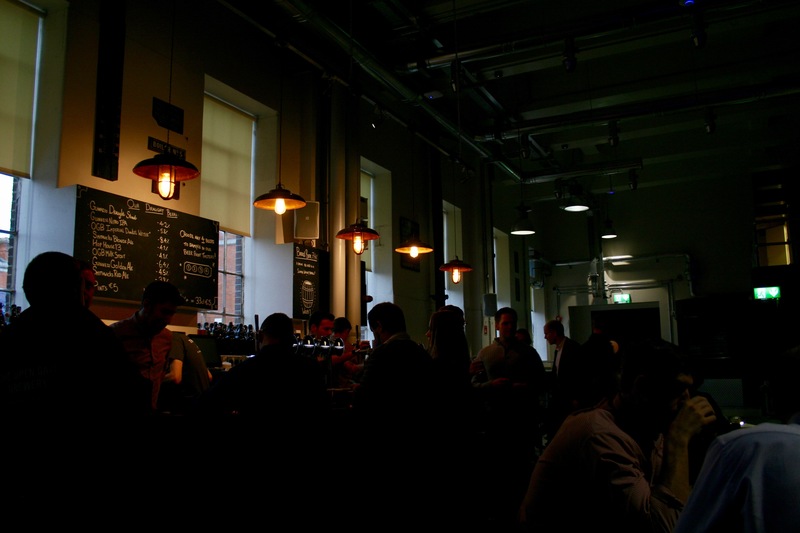 The bar inside The Open Gate Brewery – St. James’s Gate on the Guinness property in Dublin, Ireland. 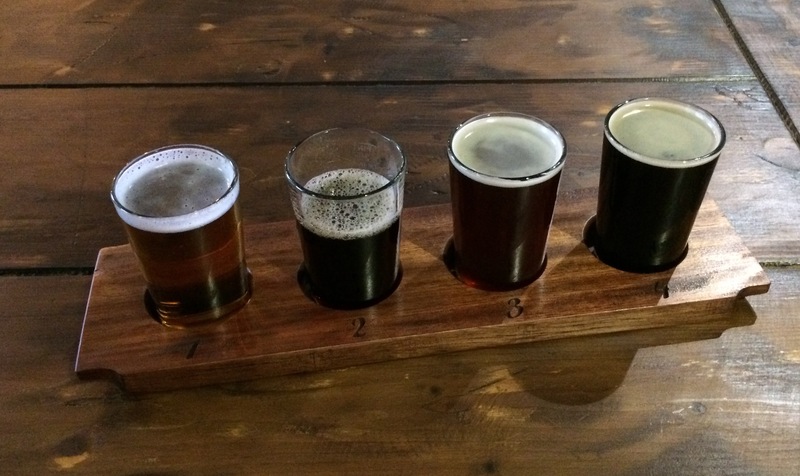 Taster tray at The Open Gate Brewery at St. James’s Gate. Tray consisted of Smithwicks Blonde Ale, OGB Barrel Beer, OGB Imperial Dunkel Weisse, and OGB Milk Stout while on a trip to Guinness. One of two Guinness draught lists at The Open Gate Brewery. 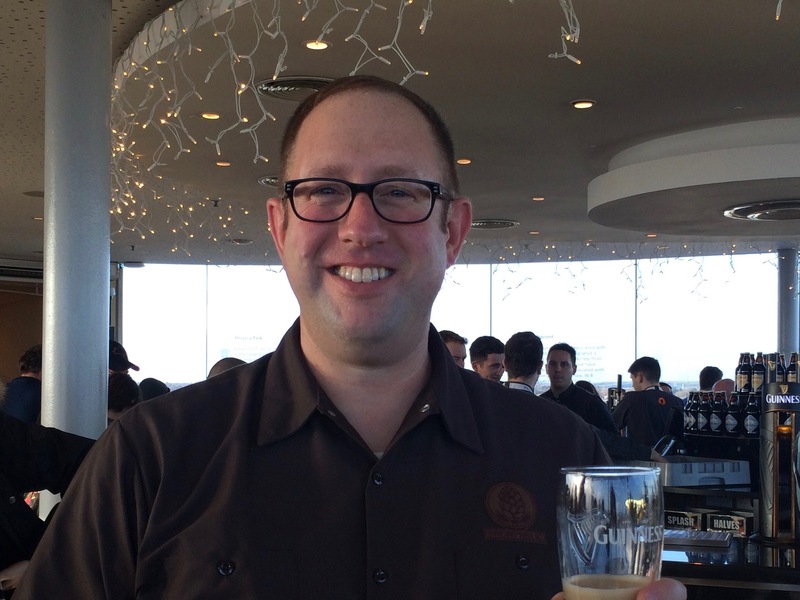 Jason Carroll, brewer at The Open Gate Brewery – St. James’s Gate at Guinness. Barrel aging inside a former Johnnie Walker barrel at The Open Gate Brewery at Guinness. 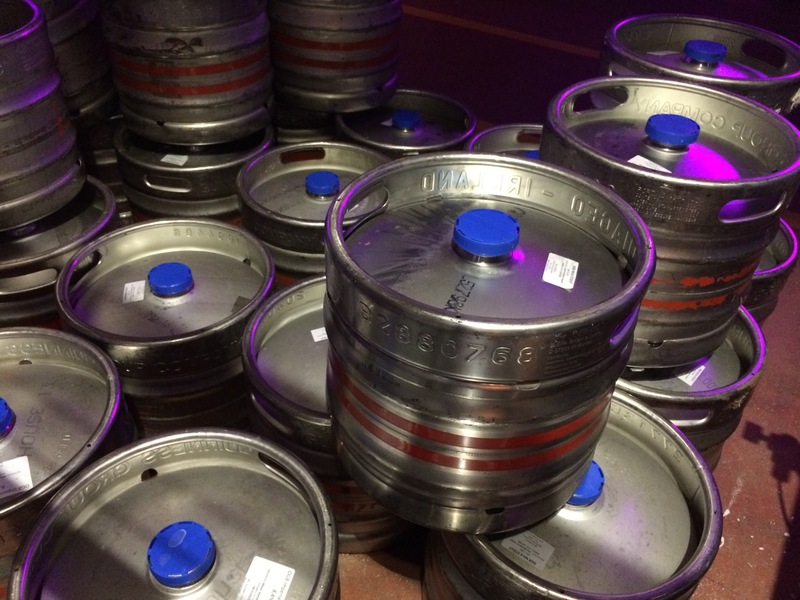 Guinness kegs inside The Open Gate Brewery – St. James’s Gate. Drinking unique varieties from Guinness at The Open Gate Brewery. 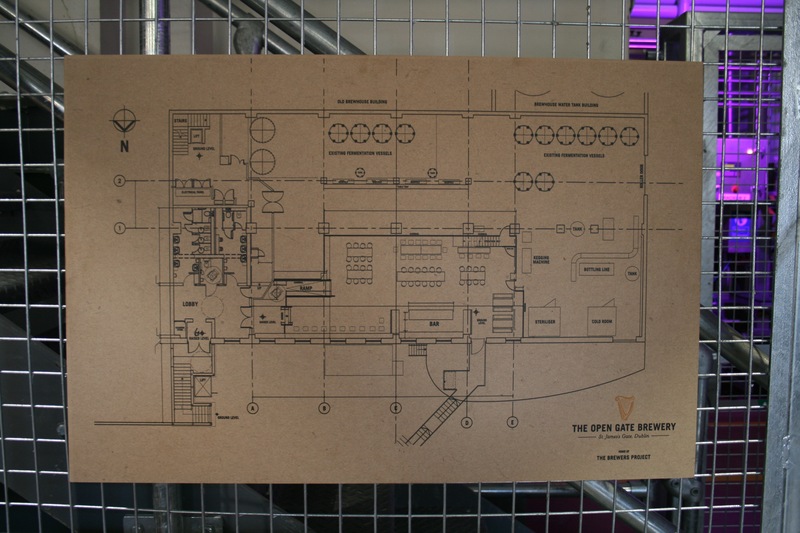 Floor layout at The Open Gate Brewery where Guinness brewers are allowed to experiment. 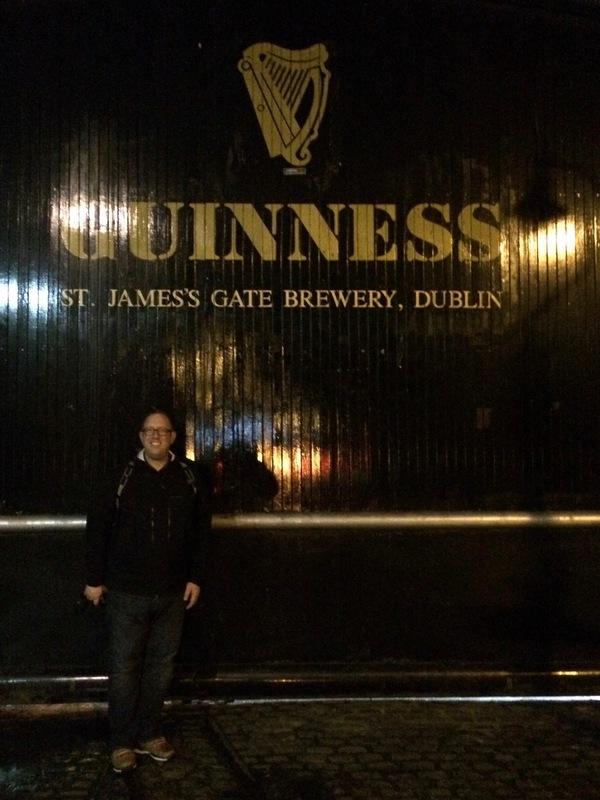 Standing outside in front of the famous Guinness Gates at St. James’s Gate. 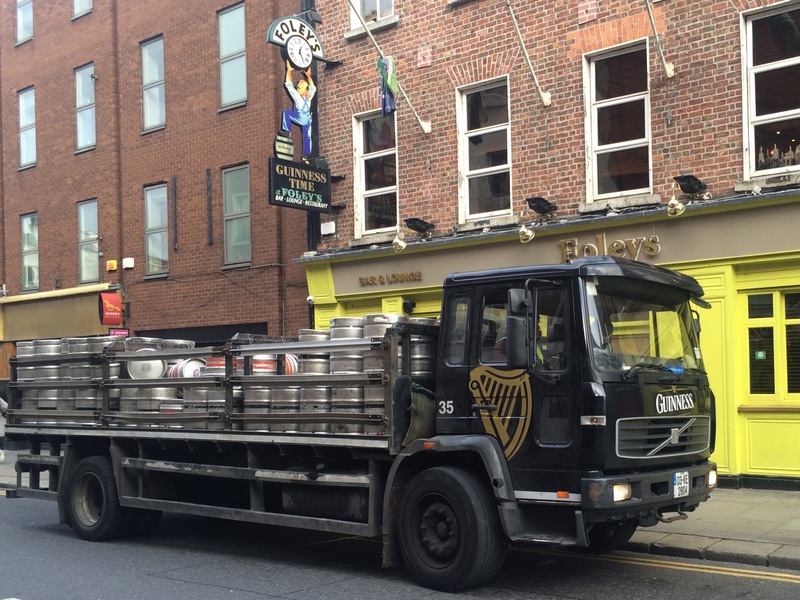 Guinness Delivery Truck in Dublin, Ireland out in front of Foley’s. The scenery is amazing in the Wicklow Mountains, the source of the water that Guinness uses to brew its beer. 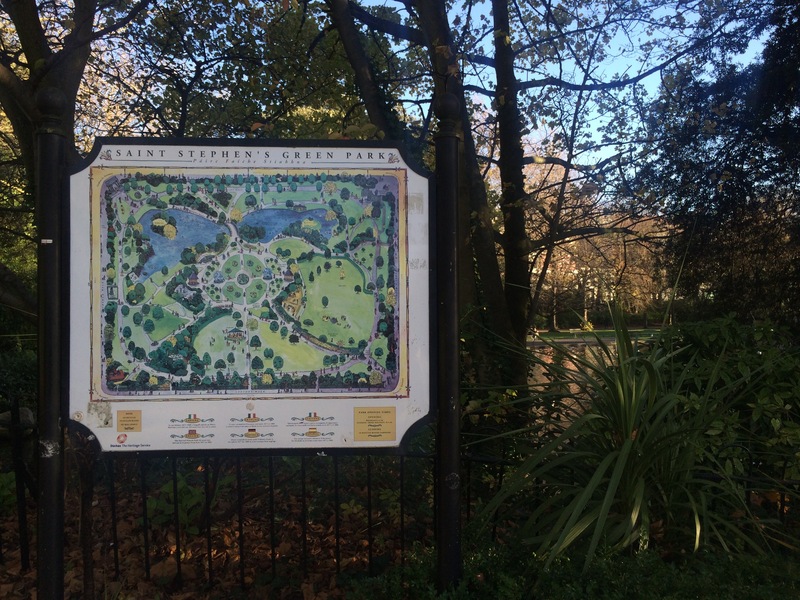 Saint Stephen’s Green Park in Dublin, Ireland. 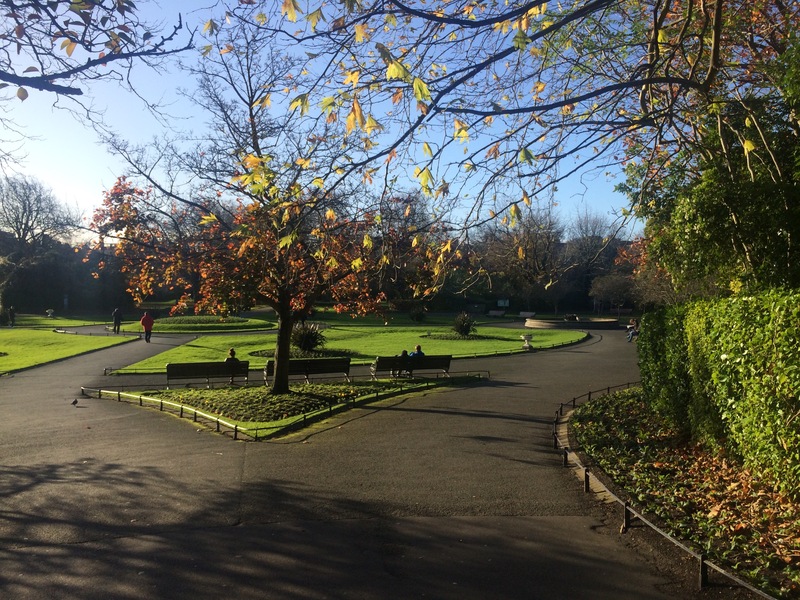 A view inside Saint Stephen’s Green Park in Dublin, Ireland. 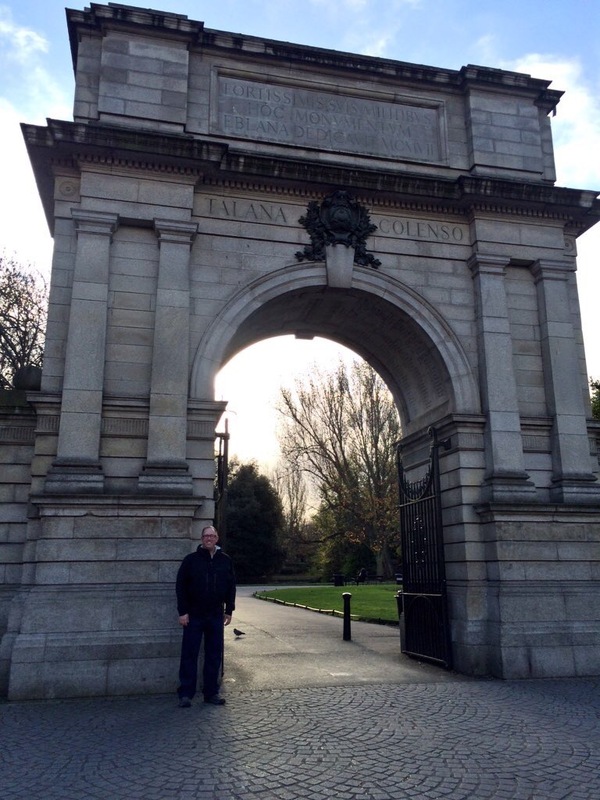 Standing in front of the entry to Saint Stephen’s Green Park in Dublin, Ireland. 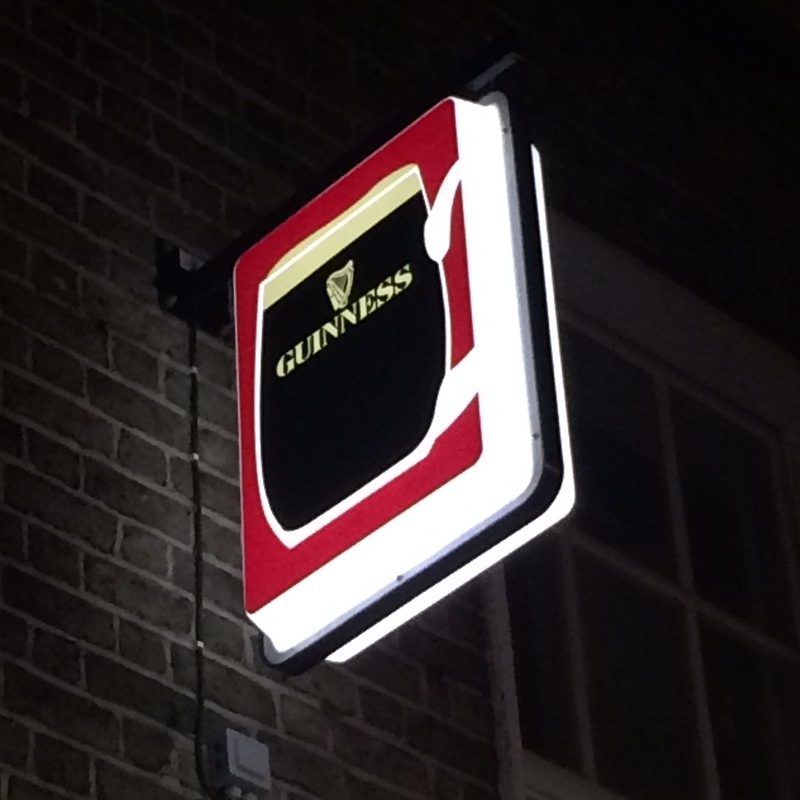 An old Guinness sign above a pub in Dublin, Ireland. 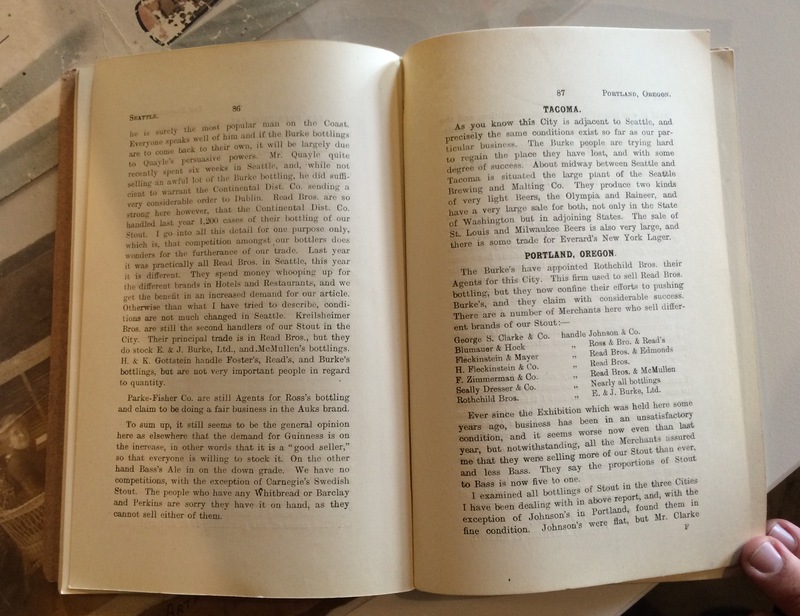 Guinness, a division of Diageo provided travel, lodging, meals and beer for the reporting of this article. I love the Guinness Storehouse. It’s where I fell in love with beer 10 years ago! A Johnnie Walker whisky barrel? Haha! Did one of the staff tell you that? There’s no such thing. Yes, this is what the brewers at The Open Gate told me. It makes sense that both companies are under the Diageo umbrella. When they told me back in December they didn’t know where the barrel had come from I said (as a joke) they should tell visitors it’s a Johnnie Walker barrel. I didn’t think they’d actually do it! Johnnie Walker is a blend: there is no Johnnie Walker distillery or Johnnie Walker barrels. Jason has moved on now, by the way. He’s head brewer at Wicklow Brewery in Redcross. Of course you were dealing with the brewery itself, in fact there is another story. That is the Guinness Ships, a project that I worked on and which I am now writing a paper about the two world first bulk beer tankers!